Image contrast and saturation digitally enhanced. The controversial Vinland Map (VM) is a medieval-style map of the Old World that includes a large island in the western Atlantic identified as "Vinilanda Insula", the Vinland of the Icelandic sagas. It came to light in the 1950s, bound together with a slender and then otherwise unknown tract dating to about 1440, entitled the Tartar Relation (TR). If genuine, the map would demonstrate that mainstream Western Europeans were aware of at least a portion of North America some 50 years before Columbus, and that this information was not restricted to Iceland or even Scandinavia. In 1957, the map was offered for sale by an unspecified private library through an intermediary dealer to the British Museum, where it was examined by R.A. Skelton, Superintendent of the Map Room, George D. Painter, Assistant Keeper in charge of incunabula (i.e. books published prior to 1501), and Dr. Schofield, Keeper of Manuscripts (Wallis 1974, p. 184). However, the binding was obviously recent, and wormholes in the map did not match those in the TR, even though the subject matter of the TR was reflected in the Asian portion of the map. Because of its lack of provenance and non-original binding, the British Museum turned it down. Shortly afterwards, Laurence C. Witten II, a Yale alumnus and New Haven book dealer, purchased the volume on behalf of his wife for $3500, and showed it to Thomas E. Marston, Curator of Medieval and Renaissance Literature in the Yale University Library. Marston was at first as skeptical as the British Museum staff had been. However, they soon discovered that a second and much thicker volume that Marston had purchased from the same intermediary, a portion of Vincent of Beauvais' well known Speculum Historiale (SH), must have originally been bound together with both the VM and the TR, with the VM at the front and the TR at the back, since the wormholes in all three aligned perfectly in this configuration, with the minor exceptions noted below. The Speculum and TR both employ an unusual mixture of vellum and paper pages, with two leaves of parchment alternating with every six leaves of paper. The bullshead watermarks on the paper are identical, and the less-than-perfect quality of the parchment is similar. The VM is on a bifolium of rather thin parchment that is essentially identical to two leaves of the Speculum (identified as l1 and l16 by Skelton in VMTR, p. 109). After this discovery, Skelton and Painter reconsidered their prior doubts about the map, and became enthusiastic supporters. An anonymous donor (later revealed to have been Paul Mellon) paid Mrs. Witten approximately $300,000 for the two volumes and donated them to Yale University's Beinecke Rare Book and Manuscript Library. In 1965, the Yale University Press published, with much fanfare, a volume entitled The Vinland Map and the Tartar Relation (VMTR) with extensive essays supporting the authenticity of the map by Skelton, Marston, and Painter, and an introduction by Alexander O. Vietor, curator of Maps at Yale's Sterling Library. These authors concluded that the map was made circa 1440, in conjunction with the Council of Basel. 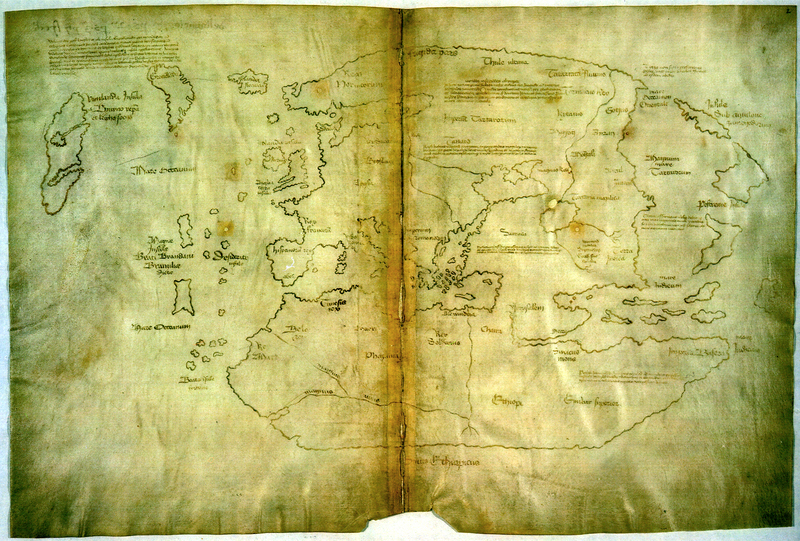 The map has an agenda clearly calculated to please the Catholic prelates assembled for the Council: Its captions tell of the Carpini mission carrying the Faith to Tartary in the Northeast, Bishop Eric Gnupsson visiting Vinland in the Northwest, Prester John established in the Southeast, and even Saint Brendan checking out the Antilles in the Southwest. In 1966, the Smithsonian Institution sponsored a conference to discuss the map. Most, though by no means all, of the sixteen authors presenting papers at this conference were inclined toward authenticity. Einar Haugen of the Harvard Department of Germanic Languages and Literature concluded, for example, that "unless other evidence is presented that invalidates the map on purely external grounds, it can be authenticated as a reflection of information conveyed to Rome by Eric Gnupsson in the early part of the twelfth century." (PVMC p. 142). Stephan Kuttner of the Yale Institute of Medieval Law called the Vinland caption "a piece of hagiographic composition, done before or in the fifteenth century, for the first bishop of Greenland." (PVMC p. 113). Robert S. Lopez of Yale's Department of Medieval Studies, on the other hand, felt that such an unprovenanced document should always be regarded "as guilty until proved innocent," and that the VM still had not made it over this hurdle. (PVMC p. 31). The Proceedings of the Vinland Map Conference (PVMC) were published in 1971, as edited by Wilcomb E. Washburn, Chairman of the Smithsonian's Department of American Studies. Opinion turned sharply against the map in 1974, however, after chemists Walter C. McCrone (1916-2002) and Lucy B. McCrone of the McCrone Research Institute announced that their tests revealed high concentrations of anatase titanium dioxide in isolated particles in the map's ink, though not on the parchment (McCrone and McCrone 1974; W. McCrone 1988, 1998). Titanium is a common naturally occuring element, but according to the McCrones, the anatase crystalline form of TiO2 never occurs in nature in the particular size and shape of particle that they found on the map. According to them, such particles occur only in modern pigments, and could not have been manufactured until after 1917. 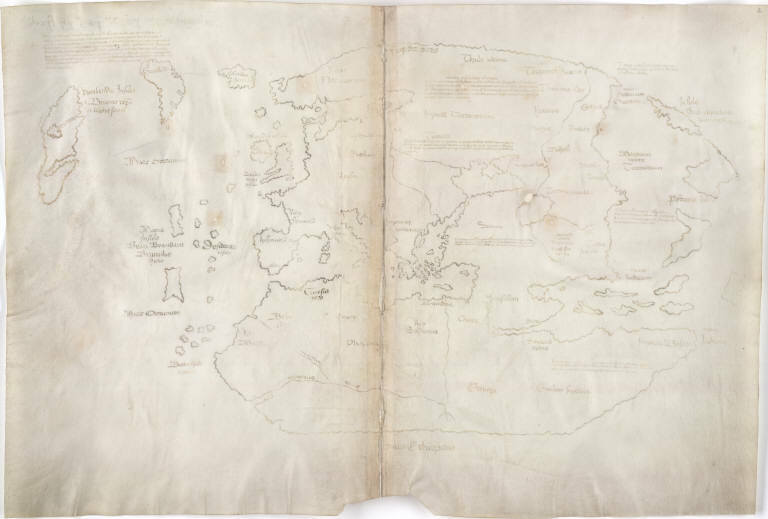 After the McCrone announcement, even the Yale Library conceded that the map was "probably a modern forgery." Despite the McCrone claim that anatase could not have been manufactured in medieval times, Jacqueline Olin of the Smithsonian's Conservation Analytical Laboratory announced in 1976 that anatase titanium dioxide crystals would in fact be precipitated as a byproduct of the medieval process for making iron oak-gall ink, provided the green vitriol used to produce the ink happened to have been manufactured from the titanium-rich ore ilmenite (Olin, 2000, 2003). And despite the McCrone claim that such particles never occur in nature, Georgia Tech mineralogist Charles Weaver reported in 1976 that the titanium dioxide that commonly occurs in kaolin clays not only takes on the anatase form, but naturally does have essentially the same particle size and shape as found by the McCrones in the VM ink. Weaver's finding shows that the VM anatase particles could in fact have come from nothing more exotic than clay-rich airborne dust. Finally, in 1987, a group led by Thomas Cahill of the University of California, Davis, used advanced Particle Induced X-ray Emission (PIXE) techniques to determine that although titanium is indeed often present in the ink, it is to be found only in minute quantities, far less than is consistent with the impression given by the McCrone report. The interdisciplinary Davis group, which had previously tested hundreds of other early manuscripts, had detected comparable titanium in several other undisputedly medieval parchments. Titanium was actually present in detectable trace amounts at five points on the VM parchment itself, consistent with "background" contamination from sources such as flaking modern wall paint or, per Weaver's findings, accidental medieval clay dust. The inked lines themselves typically had about twice this amount of titanium, but this would not be enough for the titanium to be a visible component of the ink. Four of the 33 visible inked lines on the VM that were tested showed no detectable titanium whatsoever, demonstrating that titanium in any form could not have been the base of the ink. Cahill et al. cautiously concluded that "while our work argues strongly against the specific McCrone Associates proof that the Map is fraudulent, we do not claim therefore that the Map is authentic. Such a judgment must be based on all available evidence, cartographic and historical as well as compositional" (1987, p. 832). Encouraged by these three findings, the Yale University Press declared that the map appeared to be genuine after all, and republished VMTR in 1995, with new favorable articles by Painter, Witten, Cahill with Bruce Kusko, and Washburn (VMTR95). The insured value of the value of the map was reportedly revised to $25 million. In August of 2002, two new technical articles excited considerable press coverage. One of these articles, by Olin with D.J. Donahue of the University of Arizona and Garman Harbottle of Brookhaven National Laboratories, determined the radiocarbon age of the parchment to be AD 1434 � 11 years. Although this confirms that the parchment is indeed as old as the SH and TR, it still leaves open the remote possibility that a modern forger found two connected pages of blank parchment in the SH+TR or a similarly dated volume, and drew the map on these. In the second of these 2002 articles, Katherine L. Brown and Robin J.H. Clark of University College London used Raman microprobe spectroscopy to confirm McCrone's finding of significant anatase titanium dioxide at selected points in the ink. However, even if there really is significant anatase on the map, contra Cahill, it could conceivably have had a medieval origin, either from natural clay particles per Weaver or from medieval manufacture per Olin. The issue of authenticity therefore continues to turn, as it did before 1974, on the humanistic rather than the technical aspects of the map. Without attempting to resolve the issue of the map's authenticity, the present note mentions an exciting new discovery by Beauvais scholar Gregory Guzman, and then investigates a few of the points raised in two recent papers by Douglas McNaughton and Paul Saenger. Subsequent sections look in greater detail at some of the technical aspects touched on above. Kirsten Seaver's new book is discussed at length, followed by a brief discussion of the February, 2005 NOVA program on the map. The Tartar Relation that had recently been rebound with the VM when it first came to light in 1957 is an account of Friar John de Plano Carpini's 1245-7 mission to the empire of the Mongols. Although this mission is well-known from Carpini's own Ystoria Mongolorum, the Yale TR is a somewhat different version, purportedly by a "Friar C. de Bredia," and completely unknown at the time Yale acquired the VM+TR. George Painter provided a complete transcription, translation, and annotation of the Yale TR in VMTR. At the 1974 British Library Symposium at which the McCrone results were first made public, Francis Maddison, Curator of the Museum of the History of Science, Oxford, presented what he called "A Sceptical View of the Tartar Relation." Although he confessed to playing to some degree the role of "Devil's Advocate," he stated that "doubts about the Tartar Relation are not solely engendered by the company it keeps." (1974, p. 187) He suggested, for linguistic reasons, that the TR may have been the product, not of a thirteenth century friar, but rather "of a more recent forger who had read widely in Slavonic translation." (p. 191) If the TR is fraudulent, then surely so is the VM. However, any independent doubts that there may have been about the language of the TR, along with any taint that it may have received from its association with the controversial VM, have now been completely removed by the discovery of a second copy of de Bredia's TR in a library in Luzern, Switzerland, by Beauvais scholar Prof. Gregory Guzman of Bradley University (Guzman 2004, 2006). It is bound together with a volume of Beauvais's Speculum Historale, just as the Yale TR must originally have been. The final chapters of the SH draw on Carpini's version of his mission, so that it would have been natural to have bound an alternative account of the mission together with it. The Luzern TR+SH was copied out in 1338-40, approximately 100 years before the Yale TR+SH, and therefore is the more definitive version of the TR. Although the Luzern TR+SH spent most of its career in a now-defunct Cistercian monastery in Luzern, a legal document reported by Guzman places it in the diocese of Basel in 1420, just two decades before the Yale TR+SH(+VM?) was copied there. It is therefore not improbable that the Yale TR was actually copied from the Luzern TR. Although the new TR by no means validates the VM, it does eliminate the possibility that its TR-derived captions prove it to be a modern hoax. However, if the VM is indeed a modern forgery, it is surprising that the forger would have chosen to bind it with what at the time was the unique, and therefore extraordinarily rare and valuable, known copy of a medieval manuscript. It would have been adequate for the forger's purposes to have bound the VM with a commonplace and indisputably genuine manuscript, such as a volume of the SH itself; Marston was able to pick up the Yale SH volume by itself, for example, for only �75. Although the Asian portion of the VM includes details unique to de Bredia's account, these could even more effectively have been taken from Carpini's own record of the mission. Instead he or she chose to reduce the independent value the TR would have had by removing it from its important original context and having it "keep company," as Maddison put it, with the hotly disputed VM. Guzman is currently working on a detailed comparison of the two TR texts. Unfortunately, he found no map of any kind in the Luzern volume. One of the "latest words" on the humanistic aspects of the debate is Douglas McNaughton's essay "A World in Transition: Early Cartography of the North Atlantic," in the splendidly produced volume Vikings: The North Atlantic Saga, which was published by the Smithsonian in 2000, in conjunction with its Vikings exhibition program. This prestigious venue makes McNaughton's article appear to be the quasi-official Smithsonian position on the map, despite the actual Smithsonian affiliation of both Washburn and Olin, and Washburn's favorable (though unofficial) essay in VMTR95. The New York Times covered McNaughton's article under the headline "Study Casts Disputed Map as False Link to Vikings" (Wilford 2000). Similar photo to Figure 1, but image contrast and saturation not digitally enhanced. Megazoomable SID file. Requires free download of ExpressView (MrSID) software from LizardTech. Indeed, the actual appearance of the VM today, shown in Figure 2 above without the digital enhancement used in Figure 1, is extraordinarily faint. Its inscription is much harder to make out than the black and white photo of the map that first appeared in the 1965 edition of VMTR, shown in Figure 3 below. If indeed the map looked like new in 1965, but in the ensuing decades has faded to near-invisibility, despite careful conservation by the Beinecke Library, that would truly be a highly convincing case against a medieval origin. 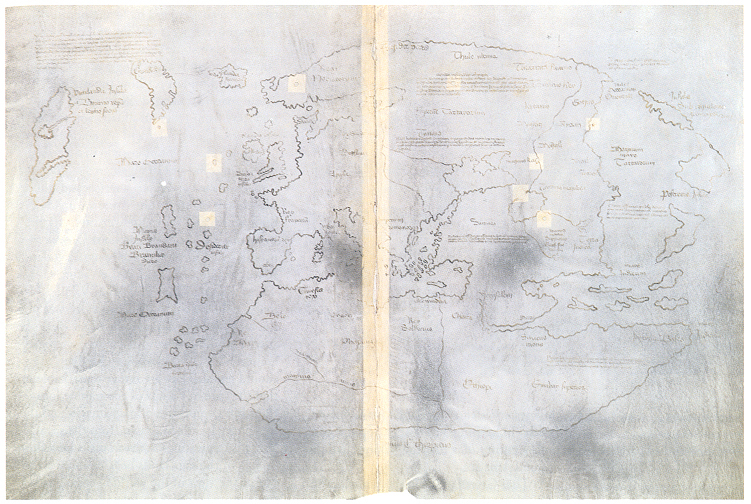 The British Museum's A.D. Baynes-Cope reported, on the basis of his 1967 examination of the map, that "The drawing is very faded, and the parchment has a 'washed-out' appearance, suggesting that it may have been chemically treated in some way" (1974, p. 209, emphasis added). Birgit Rei�land (c. 2002) details a number of such chemical treatments that were used historically in an effort to conserve medieval documents. Even map arch-critics Walter and Lucy McCrone noted the lack of black in the ink and its "faded appearance" at the time of their 1972 examination of the map. They attributed this to deliberate "flaking away" of the black upper layer by a supposed forger (1974, p. 212). It is true that the lines on the map are nowhere near as black today as they appeared to be in the 1965 photograph reproduced in Figure 3 above. However, Yale Beinecke curator Vietor admitted already at the 1966 Vinland Map conference that that photo "was not very close to the tone of the original. This was done consciously -- a very high contrast film was used in order to bring out the legends and map outlines as best we could for the publication." He apologized for any confusion that may have resulted from this not having been made clear. (PVMC pp. 38-9) Note that Figures 1 and 2 above are made from similar recent photographs, except that Figure 1 has likewise had its contrast and saturation enhanced, albeit digitally. Whatever the method or motive for the removal of the greater part of the black layer that must originally have been present, it is clear that it was already gone in 1965 and that it has not been falling off at an accelerated rate in the past few decades per McNaughton. Evidently McNaughton was unaware that the 1965 photograph was known (since the 1966 conference, at least) to have been enhanced, and jumped to the conclusion that it represented the map's actual 1965 appearance. In short, McNaughton's disappearing ink theory is a blunder that should serve as a profound embarrassment to the Smithsonian, and in particular to the Vikings volume's editors, William W. Fitzhugh and Elisabeth I. Ward. To top it off, McNaughton's confident assertion that the VM ink is based on chromite has now been refuted by Brown and Clark, who found no chromite in any of the lines on the map (2002, p. 3659). The McCrones had found some elemental chromium in the ink, but not necessarily the mineral chromite per se. Although McNaughton (2000, p. 269) has a full page box on "Scientific Studies of the Vinland Map," that cites McCrone's findings at length, he inexplicably makes no mention at all of the contrary Cahill study that led to the renewed endorsement of the Map by the Yale University Press and was featured in VMTR95. It is not entirely clear whether McNaughton is claiming that the patches are concealing ink drawings of islands that did not appear on maps until the sixteenth or even seventeenth centuries, or if he thinks that the the patches are covering holes that were made when the tell-tale islands were aggressively erased to prevent their discovery. Either way, however, he is quite wrong, as I was able to determine on June 27-29, 2001, when the Beinecke Library kindly allowed me to examine the map in person. The first interpretation falls apart because on cursory examination, the patches are in fact on the back of the map, not on the front as would be required to conceal ink drawings, however clumsily. Furthermore, they are indeed covering holes, not drawings. They do appear to be on the front in a photograph of the map that accompanied McNaughton's article, depicted below as Figure 12. However, this is only because they are glowing yellow right through the parchment due to some sort of special lighting, probably UV but perhaps IR. Perhaps McNaughton did not realize that his photograph was taken under special lighting that had this effect. During the presumably late 19th century rebinding of the TR, the original covers of the Speculum + TR volume, which had become detached, were put back on the Speculum by itself, but reversed, with the front cover on the back and the back cover on the front. In 1966, Yale decided to restore the three items to their original arrangement. In the process, modern pastedowns were removed from the covers, revealing, inter alia, that the holes in the map and the back of the Speculum would in fact continue into the covers if they were restored to their original positions (Painter in VMTR 1995, p. xvi). When I inspected the materials, I found that indeed all four of the VM wormhole pairs continue into the original front cover. (Evidently the planned restoration was then aborted, since this front cover is still at the back of the volume.) The oval Ireland hole is present, although it is on a crack in the board that has been glued, and hence is now full of glue. The tiny Greenland hole does not fully penetrate the oak board, but is nevertheless present as an indentation. This juvenile bookworm was clearly a finicky eater! Likewise, the major hole at the back of the Speculum lines up with the major hole through the TR and continues through the original back cover. Painter writes of the holes over the VM patches, "I have seen plenty of fake wormholes in the course of my professional career. You can see how they have been made with a punch, or charred with a redhot hatpin. These are the real thing, they show the dear little worm's serrated toothmarks and they were gnawed by him after the Map was made, for they visibly go through the writing" (1974, pp. 193-4). So much for McNaughton's island cover-up. The only patch on the VM that does not underlie a paired wormhole that continues into the cover and/or Speculum is the one at the northern shore of the Caspian. This patches a much larger hole than the others, one that appears to be an original flaw in the parchment. A similar, but unpatched hole appears in the TR, on the parchment leaf marked in modern pencil as pp. 10-11. The same leaf has a tear that was mended by sewing. Whatever its origin, a vast crater in central Asia could hardly be a cover-up of an Atlantic island mistakenly copied from a sixteenth or seventeenth source per McNaughton. McNaughton would have been well-advised to have actually examined the map in person before making his completely erroneous pronouncement about the function of the patches and the non-existence of the wormholes. Speaking of the wormholes, it should be noted that Judge Michael A. Musmanno (d. 1968) is reported to have found that the map holes do not line up exactly with those in the front of the Speculum (Fuoco 2000). However, that would be entirely expected, given the missing four quires. A better comparison would have been to the holes in the original front cover, since the map would have been immediately adjacent to it. I did not have the means to check this correspondence exactly when I examined the materials, but they did align as well as I could determine. McNaughton is on much more solid ground when he points out a remarkable similarity between the layout of the features in the North Atlantic on the VM, and on the splendid world map of the Genovese cartographer Nicolo Canerio, drawn around 1503 to 1505. The relevant portion of the Canerio map is shown in Figure 4 below, while the full map is online at Jim Siebold's Cartographic Images website. From McNaughton (2000, p. 264). 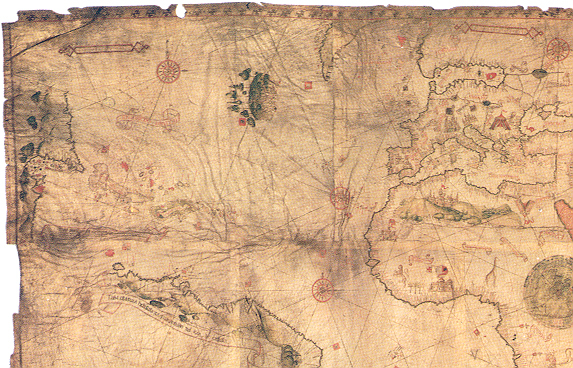 The Canerio map depicts the northern coast of South America, along with the Caribbean islands, and a fragment of the U.S. Atlantic seaboard. In mid-Atlantic, there is a strange island roughly the size and shape of "Vinland" on the VM, that has been colored solid green, unlike any other portion of the map, and festooned with several varieties of trees. According to Siebold, the Canerio map was based, in part, on the rather similar Cantino map of 1502, which reflected the latest, top-secret Portuguese data and had been smuggled out of Portugal by Alberto Cantino for the Duke of Ferrara. The green Atlantic island, which appears on both maps, is known to represent Newfoundland and Labrador. This coast, along with Greenland, had been explored for Portugal by Corte-Real in 1500-1501. Whoever drew the Vinland Map took advantage of this Mystery Island theme and on it labeled the mystery island "Vinilanda [or Winilanda] Insula" in keeping with a very popular twentieth-century idea that the Vikings had discovered America. McNaughton has a good point here, but there is an even better explanation of the similarity in this respect between the Vinland and Canerio Maps. The Canerio and Cantino maps were among the very first to employ an equirectangular projection, a type of cylindrical projection, in which lines of latitude correspond to horizontal straight lines, and lines of longitude correspond to vertical straight lines. The equirectangular projection is in this respect similar to the Mercator, except that the lines of latitude are spaced equally so that there is a constant vertical scale, corresponding to the horizontal scale along one of the lines of latitude. Figure 1.4 in John P. Snyder's cartographic history Flattening the Earth (1993, p. 7) depicts the globe as it should appear in such a projection. In the sixteenth century, latitude was easily determined by the height of stars and the midday sun above the horizon, but longitude was much more difficult to measure. With patience, the longitudinal offset of different points on land could be roughly determined a process called lunation. This required measuring the right ascension of the moon relative to reference stars by means of an armillary sphere. Since the moon moves only about 12 degrees relative to the stars in 24 hours, a difference in relative position of 1 degree would correspond to a difference in longitude of about 30 degrees. If angles, and therefore latitude, could be measured to the nearest degree, this method would therefore only determine longitude to within 30 degrees. Over a long period of time, several such measurements could be averaged together for greater precision. More accurate results could occasionally be directly obtained by measuring the local sidereal time of lunar eclipses and planetary occultations, and then comparing these at the different locations. Over the decades and even centuries, several such comparisons could be averaged to improve the measurement even further. However, explorers who did not have years or decades to wait for appropriate celestial events had to rely primarily on dead reckoning to get a coarse fix on longitude. It was not until the 18th century that reliable chronometers were developed that allowed longitude to be measured accurately at sea or while exploring new lands. I cannot read the longitude scale on McNaughton's photograph of the Canerio map, but I would assume that the longitude of Gibraltar at the western end of the Mediterranean had, after thousands of years of observation by everyone from the Phoenicians on down, been reasonably well determined relative to that of the eastern end of the Mediterranean. Indeed, the Canerio map takes Jerusalem, which is essentially due south of the Lebanese coast, as its prime meridian. Gibraltar is in fact 40 degrees, 14 minutes west of Jerusalem. Taking this as the map's scale of longitude, the eastern tip of South America is about 7 degrees too far east, not bad for a recent discovery over a long stretch of water. However, the northern coast of South America is about 15 degrees too long, so that Aruba at its northern tip is about 8 degrees too far west. As a consequence, the U.S. eastern seaboard is comparably displaced to the west. Thus, the North American promontory at the approximate latitude of Gibraltar and which I therefore take to be Cape Hatteras is about 10-11 degrees too far to the west. In Africa, Cape Verde is off by only a degree. However, the Cape of Good Hope (not shown) is 10 degrees too far east, and the Horn of Africa is a full 20 degrees too far east, making the Red Sea almost unrecognizably deformed. The southern tip of India is likewise about 18 degrees too far east. Furthermore, the Canerio map's "Mystery Island" lacks the distinctly northwest-to-southeast orientation of the true Labrador-Newfoundland coast. The northern tip of Labrador in fact lies an additional 12 degrees west of St. Johns. Instead the Canerio island erroneously shows the upright orientation of "Vinland" on the VM. The worst longitudinal errors in the Atlantic portion of the Canerio map involve Greenland itself. Thus, the map depicts Cape Farewell at its southern tip at 62 degrees west of Jerusalem, or 27 degrees west of Greenwich, when in fact it lies a full 44 degrees west of Greenwich. If it were moved 17 degrees west on the Canerio map to its correct location, it would almost touch the northern end of the "Mystery Island," which in turn should lie another 24 degrees further west than it is depicted. On the precise equirectangular projection of the Canerio map, east-west distances at northern latitudes should be expanded in proportion to the secant of the latitude. Instead, Cape Farewell inappropriately lies roughly as it is depicted, relative to Spain, Africa, and England, on the merely ad hoc layout of the Vinland Map. Furthermore, Greenland should be much wider than it appears on the Canerio map, because of the same required distortion of east-west distances on its projection. Thus, at the Arctic Circle (the latitude of northernmost Iceland), Greenland spans 23 degrees and hence should appear to be two and a half times as wide as the Iberian Peninsula (9 degrees). Instead, Greenland inappropriately has roughly the same width, relative to features in Europe far to the south, that it does on the Vinland map. McNaughton is quite correct to argue that the remarkable similarity between the layouts of Europe, Greenland, and Newfoundland-Labrador on the Vinland Map and the Canerio Map must betray a common origin. However, the layout is all wrong in terms of the precise equirectangular system of the Canerio Map, yet not unreasonable in terms of the ad hoc system of the Vinland Map. There is no reason to believe that a modern forger, who was clever enough to have found a parchment that could be positively dated to c. 1440, and to have included on his or her map choice details from an otherwise unknown tract that must have originally been bound with the same parchment, would have been dumb enough to have copied Vinland and Greenland from their grossly erroneous depiction (relative to the intended projection) on the Canerio map, instead of from a modern globe. It would therefore be far easier to conclude that the layout on the Canerio Map derives from that of the Vinland Map, than vice-versa per McNaughton! In all likelihood, the Portuguese and/or Canerio had access to a map containing the same information about the North Atlantic that 60 years earlier had been spliced onto a Bianco-style world map by the Vinland Map's compiler. Conceivably, this was the VM itself, but more likely it was one of several similar maps, now lost. When Corte-Real rediscovered Greenland and Newfoundland in 1500-01, with a good idea of their latitudes but only a very imprecise notion of their longitudes, the cartographers, who probably had no idea what projection system was used on their source map, must have inappropriately copied these features as they appeared onto the Cantino map, whence they migrated to the Canerio map. If McNaughton is right that Newfoundland on the Canerio map lies precisely where it does on the VM, relative to western Europe, it would not even have been necessary to have fudged it across the Papal Demarcation Line to justify a Portuguese claim. 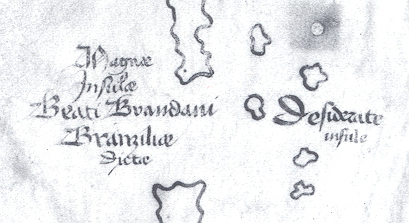 On the Vinland Map, "Vinilanda" is represented as a three-lobed island cut almost through by by deep inlets. It is generally assumed that these lobes represent "Helluland", a barren land of flat stones believed to have been Baffin Island, "Markland," a forested land identified with Labrador, and "Vinland," a land with grapes believed to have been Newfoundland. (Perkins 1974). The VM is therefore loosely using "Vinilanda" to include all three of the western lands. The lake or bay at the end of the northern inlet would then be Ungava Bay. The upright orientation of the island may just mean that the VM compiler was working from a written source that described them as running from north to south. However, another possibility is that the source map actually turned the island clockwise somewhat in order to keep Helluland from getting inordinately far from Greenland, or Vinland too close to Brittany. Some such distortions of direction are required in all but cylindrical projections of the globe. Note that India (and, I would argue, the east coast of Africa) has similarly been turned a full 90 degrees counterclockwise in the Bianco Map, and almost as far in the VM, in order to improve the fit in Asia. The coast of Norway has similarly been turned clockwise in both maps. On the Cantino and Canerio maps, the "Mystery Island" terminates at the latitude of Cape Farewell, and therefore also of the northern tip of Labrador. Evidently Corte-Real therefore did actually reach Hudson Strait, but not Baffin Island, before turning back, despite the erroneous lack of northwest-southeast drift to the "island" on the maps. Note that Corte-Real, like the Vikings, was greatly impressed with "Markland's" forestation. He evidently took Belle Isle Strait for one of the numerous deep fjords portrayed on the maps. One innovation of the Canerio map over the VM is that whereas VM follows the medieval tradition (whether based on conjecture or actual circumnavigation does not concern us here) that Greenland is an island, Canerio incorrectly follows Clavus by trying to link it to Spitsbergen, and possibly even to Norway, at the very top of the map. These latitudes, which probably were indeed impassible in the 15th and 16th centuries, are not charted on the Cantino map. In short, the Canerio map, far from demonstrating that the VM is a post-fifteenth century forgery per McNaughton, actually provides convincing evidence that the unusual information on the VM was employed by Renaissance cartographers, 450 years before VM's modern rediscovery. For further discussion of McNaughton's paper, the reader is referred to Guthrie (2000). Another recent discussion of the map, one that Tim Spalding finds particularly persuasive in his excellent website "Vinlanda: The Vinland Map on the Web", is a review article by Paul Saenger that appeared in 1998 in the journal Imago Mundi. Saenger, the curator of rare books at the Newberry Library in Chicago, raises numerous objections to the 1995 edition of VMTR and its conclusion that the map is authentic. However, he states that "the greatest deficiency of the new Yale volume is its failure to address the pal�ographical and codicological problems posed since the Vinland map's initial discovery in 1958" (1988, p. 199). Since Saenger's own field is paleography, his views in this area carry particular authority. Saenger raises three specifically paleographic objections of his own. The first of these is that "the writing out of the � diphthong for the first declension plural in legend number 63 (p. 138) in the map is both inconsistent with the scribe of the Tartar Relation (who uses only the usual medieval form e), and totally anachronistic in a German gothic 'hybrida' in the mid-fifteenth century. At this date, only an Italian humanistic script would have the � diphthong written out, and neither the Vinland Map nor the related texts in their script evince any other sign of either humanistic or Italian influence" (p. 200). As a matter of fact, the � diphthong had been in use in Gothic scripts since at least 1300 AD, as for example in Kong Valdemars Jordebog (Neilsen 1937, Fig. 21 on p. 97), albeit to write Danish rather than Latin language. This issue is therefore one of Latin orthography, rather than of paleography per se as specified by Saenger. and one that does not. The caption Saenger refers to is "Magn� Insul� Beati Brandani Branzili� Dict�" ("The Great Islands of Saint Brendan, called the Branzilians") on the two large rectangular islands south of Greenland and west of France and Spain, shown in Figure 5 above. Indeed this caption does use the � diphthong, and indeed the Latin text of the TR never does write � out that I can find, not even on the rare occasions when it is called for by Painter's normalized transcription. As it happens, Alf �nnefors had made the same observation back in 1966 (as quoted by Maddison 1974, p. 188). Saenger has apparently independently rediscovered this issue, as he does not cite �nnefors. Although Saenger does not mention it, the VM in fact does not use the � diphthong consistently, but only for this one caption. Thus, the adjacent but well-established Azores and Canary Islands are identified on it as the "Desiderate insule" (see Figure 5 above) and the "Beate insule fortune," respectively, and caption 53 at the upper right refers to "Terre non satis perscrutate". The VM compiler therefore ordinarily did follow the customary medieval Latin -e convention, contra Saenger, and apparently used the exotic -� convention only where it was called for by his specific sources. Contrary to the impression given by Saenger, the VM does in fact exhibit numerous Italian influences in both its language and its cartography, if not in its script per se, and therefore might also in its cartographic orthography. As we shall see in greater detail below, Eric Wahlgren had already in 1966 specifically proposed, on linguistic grounds, "that the unknown [VM] mapmaker was Italian" (PVMC, p. 135). Although Bianco himself refers to these islands (on a separate map in his 1436 atlas) as Santanaxio and Antillia, the adjacent Canaries are called the "Isol� dict� fortunat� sive isole ponentur (?) sancti Brandany," using both the � diphthong and the medieval -e ending, on the 1367 map of the equally Venetian (and therefore equally Italian) Marco and Francesco Pizzigano, according to Skelton (in VMTR, p. 137; Skelton's question mark). Thus, the VM compiler in all likelihood got the name for his Brendan's Islands, complete with its trendy but not anachronistic � diphthongs, not to mention their outline itself, directly or indirectly from such an Italian humanist source. It should be remembered that Basel was the center of a major Church Council at the time the TR and presumably the VM were produced. Such a Council would have attracted scholars from all parts of Europe, and in particular from Italy, to Basel, even if the VM compiler himself never made the short journey to Italy. Thomas Goldstein (PVMC, p. 52) in fact specifically proposes a connection between the VM and "the environment of geographic thought of Paolo Toscanelli." Thus, while the use of the -� ending in one isolated caption on the Vinland Map, but not in several others, is indeed a curious and noteworthy aspect of the map, it by no means invalidates it as a cartographic product of 15th century Basel. Saenger's second specifically paleographic objection to the map is that "The punctuation of the legends in the map, notably the total or almost total absence of the 'virgula', a slanting stroke, to mark inter-sentence pauses (the facsimile is not sufficiently clear to say), is inconsistent with the script of the [TR] text and also anormal for late gothic script" (p. 200). Figure 6 below illustrates a typical occurrence of such a virgula in the TR, between the words [N]est[o]rianorum and [Q]uibus in Paragraph 5 (MS p. 2, col. 1, 8th line from end). Painter's normalized transcription of the TR (VMTR, p. 59) indeed identifies this point as a sentence break, despite the lack of a capital Q on quibus. The virgula itself is the tall hairline stroke. The faint vertical bar next to it is just bleed-through from a heavy stroke on the opposite side of the parchment. Stephen R. Reimer of the University of Alberta points out, in his on-line course notes on punctuation in Medieval manuscripts, that a punctus or dot, the ancestor of our modern period, was also often used as a sentence separator. Although Saenger does not mention it, the TR in fact sometimes uses a punctus in place of a virgula, as illustrated in Figure 7 below, where it appears between voluntatem and V[est]re (TR p. 1, col. 1, line 13 in para. 1). Although the TR does ordinarily use the virgula or punctus to separate sentences, its editor Painter points out that "The manuscript of TR is . . . heavily contracted, unparagraphed, and capricious in spelling, punctuation, and capitalization" (VMTR p. 51, emphasis added). Figure 8 below thus shows an example from the TR in which neither form of sentence divider is present between fidei and Unde, despite the fact that Painter identifies this spot as a sentence break (TR p. 1, col. 2, line 3, in para. 2). This example is from the very first page of the TR, which one would expect to have been drafted with greater care than the body, as evidenced by the choice of a parchment leaf for this page, and by the use on it of red ink for both the title and a rare double-virgula paragraph divider. In Figure 8, there is a faint bar visible between the two words, and it is not entirely clear from the photograph in VMTR whether this is a deliberate mark on the surface, or just bleedthrough of something on the opposite side of the page. I visited the Beinecke Library on June 27-28, 2001, with the specific purpose of checking this out. Holding the first page of the TR to the light and examining it under 2X and 4X magnification, I was able to confirm that this mark is indeed just the bleedthrough of the first downstroke of the second u in the word Consueuerat (read Consueverat) on the next page, and not a faint punctus or short virgula. The scribe has in any event not left enough space between words for a virgula the height of that in Figure 6. Figure 9 below shows another example of an expected sentence break in the TR, where the virgula, if present, is so faint as to be absent for all practical purposes. Here the expected break is between [bru-]mali and Inchoatur (TR, p. 1, col. 1, line 2 from end, in para. 2). This example is also from the first, presumably well-drafted page. Turning now to the Vinland Map itself, its legends are for the most part simple labels that do not require punctuation, rather than complete sentences. Even isolated sentences did not require punctuation, since the virgula and punctus were used to separate sentences, rather than to end them. Thus, neither mark appears at the very end of the TR. In fact, there is only a single point on the entire VM that map editor R.A. Skelton identifies as an inter-sentence pause requiring a period in his normalized transcriptions of the legends (VMTR p. 140). This is between the words appellauerunt and Henricus in the long legend describing Vinland that appears over the island of Greenland, and is shown in the second line of Figure 10 below using the same resolution as Figures 6-9 above. between the two words on the second of the three lines shown. Same resolution as Figures 6-9. The lines of the Tartar Relation illustrated in Figures 6-9 above are approximately 5.5 mm apart on average, measured bottom to bottom. The lines of the VM legend illustrated in Figure 10 above are much more closely spaced, averaging only about 2.3 mm apart, bottom to bottom. The predominantly minuscule letters occupy less than half this space, making them only about 1.0 mm high, if that. Even with my bifocals on, I can only begin to read them with a magnifying lens. It is nothing short of a miracle of scribulatory technology that these minute, quill-written letters are legible at all. Note that the thinnest experimental line that Cahill et al. (1987) were able to draw with modern titanium paint or correction fluid was approximately 0.7 mm wide. As claimed by Saenger, there is indeed no sign of a sentence divider at the spot illustrated in Figure 10, either in the enlarged photograph in Figure IV of VMTR or when I examined the original VM under 2X and 4X magnification. However, if a divider were present, it would be approximately the size of a gnat's eyebrow on the scale of this caption. To complain of its absence is sheer nit picking. Furthermore, as has been demonstrated above, the TR, whose authenticity is incontestable per Guzman's new finding, is itself inconsistent in its use of sentence dividers, despite the much more generous size of its script. The absence of the divider here therefore does not prove that the VM is post-medieval, nor even that it was necessarily copied by a different scribe than the TR. Punctilious is defined as characterized by exact conformity to all rules and conventions -- literally that every period (punctus) be in its proper place. I can think of no better word to sum up Saenger's objection to the punctuation on the VM, unless it be, in plain English, picayune. The third specifically paleographic objection Saenger raises against the VM is, "Also, the 'trait d'union', or hyphen, on the map differs in form from that in the [TR] text" (p. 200). According to Reimer (1998), the only use of the hyphen in the middle ages was to mark words broken at the ends of lines, from the 11th century on. Presumably it had the same general form as the modern hyphen. Unfortunately, Saenger does not specify where in the VM and the TR the inconsistent hyphens he has in mind are to be found. Naturally, the VM's freely placed legends ordinarily do not require word breaks. In fact, the only place on the VM where Skelton's transcription calls for a hyphen is in the word vo[-]lutati, which is broken between the last two lines of the same minute long inscription whose sentence divider is missing in Figure 10. In the enlarged photograph of this legend in Figure IV of VMTR, no hyphen of any sort is evident. At the same time, a great many words are broken in the TR, with no hyphen to indicate the break. For example, on page 1, column 1, the word bru[-]mali is split between the third and second lines from the end, with no trace of a hyphen. Perhaps I am missing one, but I can't find a single hyphen in the TR anywhere. It therefore appears that the allegedly inconsistent use of the hyphen between the VM and the TR, like the missing sentence divider in Figure 10, is yet another non-starter by Saenger. Saenger particularly praises Barbara Shailor's "excellent 1985 catalogue of the Beinecke's medieval manuscripts" for its discussion of the Vinland Map and its associated manuscripts. According to Saenger, "A close reading of Shailor's full description of Beinecke MS 350A [the VM and TR] clearly suggests that she, as the Beinecke's cataloguer of medieval codices, had palaeographical doubts as to whether the map was in fact genuine" (p. 200). I've read Shailor's brief entries for MS 350A and the companion MS 350 (the Speculum) on pp. 183-6 of Vol. 2 of her Catalogue (in fact published in 1987, contra Saenger) over closely several times, and in fact see no indication that she was expressing any paleographical doubts of her own as to whether the map was genuine. She does dutifully note that McCrone Associates had found modern anatase titanium and had concluded that the map was probably a post-1920 forgery. But then she also notes that the Davis group subsequently found only trace amounts of titanium, "a fact that suggests the previous quantitative analysis was not methodologically sound." If anything, the fact that she did not repeat Yale Library's 1974 position that the map was probably a forgery indicates that she was leaving the issue up in the air, at least for the record. She may have expressed doubts about the map elsewhere, but she kept these hypothetical doubts to herself in her Catalogue entries, contrary to Saenger's claim. [Shailor] correctly transcribes the inscription on the verso of the map, which both Marston and Painter mistranscribed and mispunctuated in the original Yale volume. . . . The mistranslated phrase 'Drawing (delineatio) of the first part, second part, third part of the Speculum' was used in 1965 and again by Witten in 1989 to sustain a purported relationship between the map and the text of the Speculum with which it supposedly had been originally bound. In fact the phrase, as Shailor correctly transcribes and punctuates it, is ungrammatical and therefore incoherent Latin. In my judgment, the internal inconsistency in the mode of abbreviating the root par in pars and either partes or partis (whichever the writer intended) suggests a modern confabulation, likely constructed from tracings of discrete entries for the words pars and partis in Adriano Cappelli's Dizionario di Abbreviature Latine ed Italine. A reasonable explanation of the inscription on the verso of the Vinland Map might be that it was added in modern times, perhaps by a book dealer, to relate the map more closely to the genuine medieval text of the volume that is now MS 350; the hand of this inscription need not necessarily be that of whoever confected the map itself, whose latinity was consistently grammatically correct. . . . Figure 11 above depicts the caption in question, whose bleedthrough also appears in faint reverse at the upper left corner of Figure 1. It is of course important to consider every detail pertaining to the map, including this caption, and Saenger rightly invites us to think about it more carefully, and in particular in light of Shailor's precise reading of it. Saenger rightly points out that the caption could easily have been added by someone other than the scribe who drew the map, perhaps even in modern times by a book dealer who was hoping a buyer would discover the association between the two volumes. In fact, it appears to be a memorandum from the original binder to himself or his apprentice, comparable to the sequence numbers on the quires of the Speculum. The binder would have had to have known a smattering of Latin, but would not have had to have been as expert as the compiler of the VM or even its copyist. If the memo's grammar is less perfect than that of the map, this in no way detracts from the potential authenticity of the map or even demonstrates that the memorandum is modern. In any event, it is known that the original volume was taken apart and rebound in modern times, apparently circa 1900 to judge from the calf binding found on the TR and VM. The caption in question could therefore even have been added at that time, in the rebinder's best attempt at Latin, so as to harmonize as much as possible with the material in question. Hence even if the caption is modern, there is no reason to conclude that it is part of a deception. But just how ungrammatical is the caption? My reading of the caption (using the medieval abbreviation sign ~ that appears after numerals, above words, or as a crossbar on the tail of the p's) is Delineatio 1~ p~s. 2~ p~s. 3~ p~r~ spec~li. In Cappelli's dictionary of medieval Latin and Italian abbreviations, the p~s symbol is indeed a standard 15th century abbreviation for pars (1990 6th edition, p. 291). The p~r~ symbol is, as Saenger notes, almost though not quite identical to a second abbreviation that in fact is p~t~, and was used for partis or partes in the same 15th century (ibid., p. 294). It would seem to me that either partis or partes could equally be abbreviated as p~t~ or p~r~. The latter is not recorded in Cappelli's dictionary, but this obviously was never a complete compilation of every single medieval scribe's creative abbreviations, else how could it now be into its sixth, expanded edition? Shailor's precise transcription of the caption, not given in its entirety by Saenger, is "Delineacio prima pars secunda pars tertia partis [?] speculi". The question mark in brackets after partis is Shailor's, not mine. Since pars is nominative singular, and partis is genitive singular, this would literally read "Drawing first part, second part, of the third part of the Speculum", if my 9th grade year of Latin still serves me correctly. This indeed is a rather ungrammatical shift in case. Using genitive for all three parts (in the sense of "belonging to") as in the VMTR mistranslation Saenger cites above would be ideal, but nominative singular throughout ("Drawing first part, second part, third part of the Speculum") would be acceptable as a fragmentary bookbinder's memorandum. However, as Saenger himself points out, p~r~ (or at least p~t~) could equally represent partes, the nominative plural of pars, instead of the genitive singular partis. Shailor herself admitted with her bracketed question mark that she was not certain of partis. With this reading, the caption becomes "Drawing first part, second part, third parts of the Speculum", and the awkward case shift is avoided. It is still true that if the plural is used after "third", the singulars after "first" and "second" become redundant, so that "Drawing first, second, third parts of the Speculum" would have been an improvement, but the caption as written can hardly be called "incoherent" per Saenger. Saenger darkly suggests that his purported modern book dealer lifted these symbols (albeit imperfectly) from an early edition of Cappelli's dictionary in order to establish a connection between the two volumes. However, a far more reliable way to call a potential buyer's attention to the connection between two volumes being offered for sale at the same time and apparently from the same unspecified library would have been simply to announce in the catalog that both volumes use the same paper, similarly interspersed with parchment, and may therefore have been produced by the same scriptorium, even if the dealer chose, for dramatic effect, to leave it to the buyer to "discover" for himself that the wormholes align. A much easier explanation for the odd abbreviations is that a fifteenth century bookbinder merely lifted them from his repertoire of valid fifteenth century abbreviations (with an improvised but completely natural substitution of "r" for "t" in the fancy plural form), and was merely trying too hard to show off his Latin skills to his apprentices by unnecessarily using both singular and plural symbols. Ever-punctilious, Saenger claims that Shailor, unlike the VMTR's "amateurish" Marston, correctly punctuated the caption in question, thereby helping to demonstrate its "incoherence" as Latin. It is true that Marston (in VMTR, p. 3) incorrectly puts a punctus after "third part," even though there is no mark there, and a colon after "first part," even though the second dot there appears to be just a stray mark. In fact, however, Shailor gives it no punctuation at all, as may be seen above, despite the perfectly clear appearance of a punctus (which could serve as a modern comma) after "first part" and again after "second part". Furthermore, Witten, in his contribution to the 1995 edition that Saenger is supposedly reviewing, does correctly report the punctuation, for what it's worth, even though he incorrectly reads all three abbreviations as partis: "delineatio primae partis. secundae partis. tertiae partis" (Witten in VMTR 1995, p. xlix). Once again, Saenger doth protest too much. Saenger, as quoted above, questions the use of delineatio itself in the caption as evidence that it could not have been added before the 16th century. However, if I read the 1879 Lewis and Short Latin dictionary correctly, this word appears already in the 3rd c. A.D. writings of the Christian writer Tertullianus, to mean sketch or delineation, and therefore was fair game in this sense in the 15th century. While I have no argument with Saenger's claim that it was not specifically used to mean map before the 16th century, there is no reason to think that this would be its specific meaning on the reverse of the VM. To the binder, the map was simply some sort of sketch or drawing that he had been instructed to incorporate with the separately written material of the Speculum. To object to the map's identification in this context as a delineatio is yet another red herring on Saenger's part. Despite Saenger's professed respect for the precision of Shailor's reading of the "delineatio" caption, Shailor in fact gives delineacio, even though Saenger reports the same word as delineatio. From Figure 11 above, it may be seen that it is perhaps a close call whether a t or a c was intended. Certainly -tio would be the classical Latin form. Whichever was meant, however, it is disingenuous of Saenger to claim that Shailor, unlike the VMTR authors, transcribes the inscription correctly and that this demonstrates the latters' paleographic incompetence, when in fact Saenger himself dismisses part of her reading. Neither Shailor nor Marston gave any specifics to back up their contrary claims, so I regard this important issue as unresolved and as one that should be carefully studied by competent handwriting experts. However, it should be noted that just a few different letter forms would not be conclusive of different penmanship, since there are in fact several inconsistencies within the map itself. Just to take the Magnae Insulae Beati Brandani Branziliae Dictae legend in Figure 5 above, the l in Insulae is different from that in Branziliae, the r in Brandani is different from that in Branziliae, the n in Magnae differs from those in Brandani, and three different forms of the � diphthong itself are used, even though it would be absurd to think that two or even three scribes penned this one legend. Furthermore, the minuscule d in Brandani differs from the minuscule d in the adjacent Desiderate Insule legend, even though the majuscule Ds in Dictae and Desiderate are identical, despite their inconsistent endings. If the VM was indeed written by a different scribe than the TR, as Saenger believes, the inconsistency between the occasional -� endings on the map and the uniform -e endings in the TR is no longer so remarkable as he makes it out to be. Saenger reports that "An oral tradition, perhaps apocryphal, tells us that the late Bernhard Bishoff on a visit to Yale once saw the map and laughed" (p. 200). Surely it must be Saenger himself who is joking if he believes that gossip about a guffaw is any substitute for a published analysis or even a verified casual opinion of the map. Likewise, "Stephan Kuttner is reported to have been sceptical, but he never published his views" (p. 200). As a matter of fact, Kuttner's views were published, in the proceedings of the 1966 Vinland Map conference. Despite the map's numerous peculiarities, Kuttner concluded, "This points once more in the direction not of forgery but of compiled or conflated readings as the source of our caption writer. A sophisticated modern forger -- if we contemplate for a moment this possibility -- would not be so poor a Latinist as to make Pascali the genitive of Pascalis once he took the trouble of finding the name of the pope who reigned in the years of Bishop Eirik's mission. He would not have produced the impossible scrambling of two ecclesiastical functions.... A modern forger, finally, would not be so clumsy as to designate both Innocent IV (1243-45) and Paschal II (1099-1118) sanctissimus pater noster, that is, as now reigning (or reigning within living memory)." (VMTR p. 112) It of course would not be surprising if Kuttner reversed this position after the McCrone report was released in 1974, as did almost everyone involved in the original debate but George Painter (Painter in VMTR95, p. ix). I'm willing to enter hearsay evidence on his later opinion into the record, but not without knowing who heard it said, what Kuttner's specifics were, and when he took this view relative to the McCrone announcement. In a veritable tour de force of name-dropping, Saenger objects that "the pre-eminent medieval pal�ographers (such as Bernhard Bischoff, T. Julian Brown, Jean Vezin, Malcolm Parkes, Paul Oskar Kristeller, Giuseppe Billanovich, Albert Derolez, Richard Rouse and Pieter Obbema) have never formally been invited to voice their opinions on the map as a medieval manuscript, either collectively or individually, although many of these erudites must certainly have passed through or near New Haven" (p. 200). If these individuals indeed had something to offer, they were certainly welcome to invite themselves to see the map, as I myself easily did even without their credentials. The fact that they never bothered to is irrelevant to both the paleography and the authenticity of the map. One could just as unjustifiably conclude that it proves that they were completely satisfied with it. The fact that Yale Library and Yale University Press never invited their opinions reflects perhaps on the thoroughness of the Yale investigation of the matter, but not on the map itself. Saenger notes as further alleged evidence of VM's paleographical deficiencies that "It should also be remembered that the map was shown to and rejected by the curators of the Department of Manuscripts of the British Library (T. Julian Brown was then Assistant Keeper), before it was offered to Yale" (p. 200). However, Saenger does not mention that Painter and Skelton were also among the experts at the British Library (then a part of the British Museum) who examined the map. They were equally skeptical at that time, and became enthusiastic proponents only after the wormholes in the VM, TR, and Speculum were later shown to align. Saenger gives us no indication of Brown's view after the wormholes came to light. Saenger furthermore does not tell us that one of Painter's own specialties is paleography (Painter 1974, p. 193). The 1957 rejection of the map by the British Museum therefore reflects more on its lack of physical context at the time, than on its paleography as per Saenger. While we are on the subject of the British Museum's 1957 rejection of the VM + TR volume, Saenger approvingly mentions "John Parker's suggestion that Irving Davis (the English dealer who in 1957 had tried, without success to sell the Vinland Map to the British Library prior to Witten's involvement) might conceivably have planted the manuscript of Vincent of Beauvais in the hands of Witten's New Haven friend Thomas Marston so that Witten could 'discover it' as the codex from which the Vinland Map had been removed." This is an interesting thought, but if true, why didn't Davis make sure that the British Museum staff themselves "discovered" the Speculum connection back in 1957, rather than allowing the map to be rejected there, and thereby devalued to the paltry $3500 his seller received from Witten? A further objection Saenger raises to the VM is that "eccentric Latinization of both place and personal names suggests a fake. Particularly egregious is Erissonius for Eiriksson where the normal medieval Latin would be Erici filius or Henrici filius" (p. 199). In fact, this objection had already been disposed of back in 1966 by linguists Einar Haugen and Eric Wahlgren. Haugen (PVMC, p. 141) points out that the map's use of Irlandia for Ireland, Gronelanda instead of Gronlandia for Greenland, for Vinland and Erissonius in place of the expected Erici for Eiriksson simply indicates that the compiler was a "non-Scandinavian." Wahlgren (PVMC, pp. 134-5) goes on to propose that the extra internal ("svarabhakti") vowel in Gronelanda, Vinilanda, and Isolanda, plus the conversion of kss to ss in Erissonius itself, not to mention the compiler's lack of comprehension of the patronymic nature of this name, specifically indicates, "that the unknown map-maker was Italian." Saenger's objection to the "eccentric Latinization" of these names thus goes hand in hand with his failure to see the Italian influences in the cartography and orthography themselves, noted above. Saenger also objects that "the Vinland Map's northern orientation, if indeed it truly reflects a thirteenth century lost original, would be without precedent in the Latin West among non-climatic, pre-fifteenth-century world maps" (p. 199). Although the Vinland and Greenland data on the map would, if brought back by Bishop Eirik, have dated to the 12th century (not the 13th century per Saenger), the Vinland Map itself is (if authentic) as much a production of the 15th century itself as is the 1436 Bianco Planispheric World Map on which it is based. Pre-fifteenth century world maps are therefore already an irrelevant comparison. By 1440, northerly oriented Ptolemaic maps had already been circulating and recopied in Europe for three decades. Indeed, we need look no further for such a map than the very same atlas in which Bianco published his Planisphere. On an adjacent page, Bianco included a north-oriented conic projection of the world based on the Ptolemaic data for comparison to his "modern" map. A copy of Bianco's 1436 Conic World Map may be viewed at http://www.capurromrc.it/mappe/!0119bianco.html. The concept of orienting a map with north at the top would therefore have been well known to any student of Bianco's planisphere. The admittedly novel decision to turn the VM in the Ptolemaic direction was undoubtedly influenced in part by the fact that by the time Vinland and Greenland were tacked onto Bianco's planisphere, it fit the page much better in this orientation. Saenger does raise several troubling issues concerning the provenance of the map. However, if the map was indeed stolen from some library before it was purchased by Witten, that would simply mean that Yale is not its rightful owner. It would not reflect on its authenticity per se. McNaughton and Saenger both approvingly cite Kirsten Seaver's work on the Vinland Map, and in particular her 1995 article in The Map Collector. Seaver has expanded on this ideas in her 2004 book Maps, Myths, and Men, which is discussed at length below. In 1972, McCrone Associates were asked by the Yale Beinecke Library to perform a physical study of the map and its ink (Walter McCrone and Lucy McCrone 1974; W. McCrone 1988, 1998). Their technician, Anna Teetsov, removed 29 small samples from the VM, along with 7 from the TR and 18 from the SH for comparison. One of these samples is shown in Figures 2 and 3 of McCrone (1988), and is approximately 100 X 200 micron (0.1 X 0.2 mm.) in size. On examination of these samples with polarized light microscopy (PLM), they found that several of them contained isolated "small areas, a few square micrometers" (1988, p. 1011; 1 micrometer = 1 micron = 0.001 mm.) that appeared to be rich in the anatase crystalline form of titanium dioxide. In Figure 3 of McCrone (1988), these appear as black specks, perhaps 5 or 10 micron in dimension. On training a special micro X-ray diffraction camera with a resolution of about 7 microns on these areas, they were able to confirm the presence of anatase, mixed with calcite and some quartz. Other analyses confirming the presence of titanium and/or anatase were also able to be focused on these tiny particles. Their electron microprobe analyzer was thus able to produce results from an approximately 100 cubic micron (4.5 microns cubed) sample. Their ion microprobe analyzer studied samples ranging from 4 to 10 micron in average diameter. They were then somehow able to physically isolate some of these tiny particles, typical ones of which are shown in Figures 4 and 5 of McCrone (1988). These are both about 5 X 10 micron in dimension, and under a transmission electron microscope (TEM), are shown to be aggregates composed of small rounded pellets. One of these particles, described as "the smallest possible subnanogram portion" (1 nanogram of anatase would fill a cube about 6 microns on a side) was crushed between glass slides and examined by TEM, as shown in Figure 8 of McCrone (1988). It was found to be composed of rounded and somewhat elongated single crystals ranging in size from 0.03 to 0.5 micron in diameter (McCrone and McCrone 1974, p. 212), and averaging about 0.15 micron in size (McCrone 1988, p. 1011). According to the McCrones, anatase crystals of such a size and shape are not found in nature, and could not have been manufactured in the Middle Ages, yet they are found in modern titanium-based paints, which were not manufactured before 1917. Larger anatase crystals do occur in nature, but if they were crushed to a powder, they would have neither the uniform size distribution nor the rounded shape found on the VM. They concluded that a forger must have used a modern, anatase-based paint or pigment as a component of his or her ink. Specifically, the VM ink lines tend to have a fine yellowish border that extends slightly beyond the black line. This is a normal consequence of age in medieval documents, and in fact was originally thought of as an indication of the VM's authenticity. McCrone argues that in order to give the map this appearance of age, the forger actually inked it twice -- first with a titanium-bearing yellowish ink to make the yellow line, and then again with a slightly narrower black line. According to the McCrones, "well over 90 per cent" of the black line was then manually flaked off in order to hide the forger's tracks and to give the map a further appearance of antiquity. They found the anatase particles in the yellow line, but not in the remaining portions of the black line. Despite the McCrone claim that anatase crystals such as those found in the VM ink do not appear in nature, Weaver (1976) reports that the TiO2 that is commonly present in kaolinite clays consists mostly of rounded anatase pellets, ranging from 0.05 to 0.20 microns in size, with 0.10 micron "being a good average value" (p. 216). This is a remarkably close match to the range of 0.03 to 0.5 micron and average value of 0.15 micron found by McCrone on the VM (1988, p. 1011). Furthermore, Weaver found that while these anatase pellets tend to cluster together in clumps of 2-10 or more, they are often found in larger aggregates composed of tightly packed pellets, ranging from 5 to 10 microns, and occasionally up to 80 microns in diameter (p. 216). Weaver's naturally occuring kaolin anatase aggregates thus correspond well in size with the anatase-rich particles isolated and analyzed by the McCrones. The preliminary McCrone PLM examination of their ink samples found "low refractive index particles, probably ... minerals like quartz, clays, feldspars, etc." (McCrone 1988, p. 1011, emphasis added.) These particles could as easily have been medieval as modern, and so were not subjected to the detailed analysis received by the anatase particles. However, they show that the McCrones' own analysis was at least consistent with the presence of particles of some form of clay elsewhere in the ink. Although most common clays do not contain kaolinite as their principal ingredient, Weaver (personal communication 2004) states that he "would not be surprised" if anatase pellets similar to those he found in kaolin existed in other clays formed by weathering. Although anatase-bearing clay dust could easily have blown in an open window and accidentally settled on the parchment, it may actually have been introduced into the writing process deliberately. According to Pete Goebel of Goosebay Workshops, a calligraphic supply e-store, "flour of clay, preferably light in color" (as is kaolin), was one of some 20 substances known to have been used as "pounce" to blot wet ink and/or to prepare the surface of parchment before writing (personal communication). Kaolin clay is particularly prized as an absorbent. Garman Harbottle has cogently suggested that any clay particles that came into contact with the water-based ink would have become suspended in it, and then have become fixed to the parchment as the ink dried. However, any such clay particles on the dry parchment would have been free to fall off as the parchment was handled, whence the absence or relative absence of detected anatase on the parchment itself (personal communication). Furthermore, Weaver (personal communication 2004) notes that today kaolin is often added directly to ink, as a pigment in its own right and in order to give the ink body. Although none of the medieval iron ink recipes I have seen actually calls for the addition of clay, this simple amendment could easily have been employed. In 1974, the McCrones could not have known of Weaver's 1976 finding of VM-like anatase particles in kaolin clays. However, neither McCrone (1988, 1998) nor Towe (1990) so much as mentions Weaver's article, despite its great potential relevance to the presence of anatase in the VM. In 1988 or 1990, the relevance of Weaver's finding could perhaps have been overlooked by McCrone, and perhaps even by Towe despite the fact that he is a specialist on clays. However, private researcher Ardell Abrahamson called Wilcomb Washburn's attention to the Weaver study, who in turn cited it in his contribution to the 1995 edition of VMTR (p. xxvi). There is therefore no excuse for McCrone's continued insistence in his 1998 paper that the VM anatase particles could not have had a natural origin. In private communications, Kenneth Towe has objected that clays contain at most 3% TiO2. Weaver used a calgon dispersing agent, intense sonic treatments, and a centrifuge to separate anatase TiO2 from the bulk of the clay. These methods were not available in the middle ages, yet McCrone found anatase clusters on the VM that were not at least 97% kaolinite. Unfortunately, Towe did not take the opportunity to make these points, as even a brief aside, in either his 1990 article, or in his 2004 reply to Olin's 2003 presentation of her ink argument. However, if clay were broken up as air-borne dust or pulverized into "flour" with a mortar and pestle, or if it were suspended in aqueous ink, Weaver's anatase aggregates could easily have become separated from the bulk of the kaolinite overburden. In any event, the clusters analyzed by McCrone Associates were isolated and even mechanically separated from whatever background material was present by heroic 20th century laboratory methods, and even then were only 20-30% anatase. This isolation and mechanical separation would not be a commercially viable way to produce even highly impure anatase pigment, but it was performed in a modern laboratory, not in medieval times. As noted above, McCrone Associates did find some aluminum and silicon in most of these clusters, which would be consistent with an origin from clay. They even noted the presence of separate particles consistent with clay, but did not deem these worthy of further study at the time. It should be noted that Weaver himself has indicated that he would expect anatase from clay to be associated with more iron than typically was reported in the McCrone analyses, since a strong magnet is ordinarily able to remove most of the anatase from the surrounding clay (personal communication, 2004). Nevertheless, in his 1976 article (p. 216 and Fig. 12) Weaver indicates that some of the TiO2 aggregates are not removed by the magnet. These aggregates, at least, would contain relatively little iron. See also new section Update 2008 below. Despite the McCrone claim that anatase particles such as those found in the VM ink could not have been manufactured in the middle ages, Olin (2000, 2003) finds that if the standard medieval process for making the ink ingredient green vitriol (aka copperas, aka ferrous sulphate) is applied to the mineral ilmenite (FeTiO3), anatase titanium dioxide precipitate is one of the end products. This anatase would then turn up in the ink. Her findings were first reported at a 1976 conference, and have been discussed extensively since, even though they were only first published in 2000. W. McCrone (1988, p. 1017) acknowledges that Olin's reaction produces very finely divided anatase, but dismisses its relevance on the grounds that "to convert this product to a VM-type anatase requires a calcining step at very high temperatures (800-1000 deg. C). This is inconceivable as a 15th century process." Cp. also Towe (1990, pp. 84-85); Brown and Clark (2002, p. 3660). George Painter, however, has pointed out that "in the real world such metallurgical temperatures were not only familiar to medieval chemists and alchemists but have also been evident ever since the prehistoric bronze-smiths of 3000 B.C., even in the Norse-American context of the L'Anse-aux-Meadows charcoal-fueled smithy, already cited for its titanium-trace slags, where a furnace temperature of 1200 deg. C. has been estimated" (in VMTR 1995, p. xii). Recall that calcination per se is simply the age-old process of roasting limestone to make lime, requiring temperatures of 1000 deg. C. according to Heinemeier and Jungner (1994, p. 35). "Calcinacioun" is in fact specifically mentioned c. 1387 in Chaucer's Canterbury Tales ("The Canon Yeoman's Tale," line 251). Wallace (2000, p. 212) confirms a 1250 deg. C. temperature from L'Anse aux Meadows. As it happens, medieval ink recipes commonly call for reducing the green vitriol to a powder before mixing it with the other ingredients, in order to facilitate dissolution, and at least one such recipe actually calls for the green vitriol to be "calcined to whiteness" and then "triturated" (ground) for this purpose (Carvalho 1904, Ch. 21). Nevertheless, Kenneth M. Towe of the Smithsonian's Department of Paleobiology (personal communication, Jan. 2004) has pointed out that while temperatures below 300 deg. C. would be adequate to reduce green vitriol to a powder per Carvalho's recipe, at only moderately higher temperatures and far short of those required to convert the anatase particle size, the vitriol would break down into dark red polishing rouge, known in the medieval ages as colcothar, and would become useless for making ink. Therefore, although medieval technologies could have accidentally produced anatase particles of the size found on the map, despite McCrone's assertion to the contrary, there is no compelling reason to think that these would have ended up in the ink. Ardell Abrahamson has recently called to my attention an article in which J.C. Deelman (1979) reports that well-crystallized anatase can be produced from amorphous TiO2 at room temperature (25 deg. C), through a repeated cycle of wet and dry conditions, so that the calcining temperatures demanded by McCrone would not in fact be necessary to enlarge the particle size in Olin's precipitate to that found on the map. However, since some 1500 hourly wet-dry cycles were necessary to achieve these results, it seems unlikely that green vitriol made from ilmenite would have been subjected to this process prior to preparing ink. It is possible, however, that something like Deelman's mechanism accounts for the natural presence of well-crystallized anatase particles in kaolinite clays. Olin (2003) goes on to stress that the elements copper, aluminum, zinc and gold that are present in the VM ink strongly suggest impurities that would have arisen during genuine medieval ink production methods, but not in a modern replica of medieval ink. She calls for further technical studies of medieval documents to determine the precise composition of their inks. Cahill et al (1987) found at most 10 nanogram/cm2 of Ti in 33 visible ink samples on the map, with a median value of 1.0 ng/cm2. Four of the 33 lines showed no detectable titanium whatsoever (< 0.2 or 0.3 ng/cm2), demonstrating that titanium in any form could not have been the base of the ink. Titanium was actually present in detectable trace amounts at five points on the VM parchment itself (median value 0.5 ng/cm2), consistent with "background" contamination from sources such as flaking wall paint or windborne clay dust particles. The inked lines themselves typically had about twice this amount of titanium (median value 1.0 ng/cm2 for the ink plus parchment combined), but this would not, they argued, be enough for the titanium to be a visible component of the ink. McCrone countered that "If Cahill's 10 ng/cm2 is concentrated in an ink line, it corresponds to nearly 4 million anatase particles in a 1 cm length of ink line." (1988, p. 1016) McCrone does not provide the details of his calculation, but the following assumptions will yield 2 million particles per cm of ink line, which is reasonably close: 10 nanograms Ti per cm2 of target area per Cahill et al's maximum value; 0.5 cm2 inked line per cm2 of target area; 0.1 cm2 inked line per linear cm of inked line; elongated ellipsoidal anatase crystals with long axis averaging 0.15 micron per McCrone (1988, p. 1011), and both short axes half that or 0.075 micron; TiO2 60% Ti by weight; density of anatase 3.9 gm/cc (per the Kronos, Inc. website). Simply shortening the long axis to 1.2 micron and the short axes to 0.6 micron would in fact yield McCrone's 4 million figure. Cahill's median Ti value of 1.0 ng/cm2 is far more representative of the Ti content of the ink than his maximal value of 10 ng/cm2. Using it reduces the number of particles to 400,000 per cm of inked line using McCrone's calculation, or 200,000 using mine. Either way, this still sounds like a lot of particles. However, it must be remembered that each crystallite is shorter than the wavelength of visible light (about 0.4 - 0.7 micron), and therefore is unresolvable under even the strongest conceivable visual microscope. If these unresolvable particles were spread out one deep, they would cover less than 0.2% of the inked area, using my assumptions. There therefore really is a substantial difference between Cahill's findings and the impression McCrone gives that the anatase is an important, visible component of the yellow line. McCrone's online Vinland Map Update indicates that he was still sticking by his original position shortly before his death in 2002. As he correctly points out, the mere fact that the Cahill group's methods are "high-tech" does not necessarily mean that they are more accurate than his more traditional techniques. Both their studies should be replicated by other laboratories to determine which is in error. Towe (1990) generally supports McCrone, but does not demonstrate where Cahill et al. have gone wrong, if they have. More recently, Brown and Clark (2002), using advanced Raman microprobe spectroscopy, report that they have confirmed McCrone's finding of anatase at at least five points in the yellow line, but not elsewhere on the map, and conclude that a modern origin for the VM is "strongly indicated." Brown and Clark use an approximately 5 micron diameter laser spot size and do not report whether anatase was found in every target they examined or in just a few out of a great many. The fact that they use this beam to search for other minerals and are able to declare them to be altogether absent suggests that they may have searched the entire map for anatase and found only 5 spots containing detectable anatase. However, in a private communication, Clark has confirmed, without giving details, that their findings are indeed quantitatively inconsistent with the Cahill group's. Nevertheless, given the findings of Weaver and Olin, there is no reason that even an abundance of pigment-sized anatase particles should necessarily cast doubt on the authenticity of the map. Brown and Clark do search for, and fail to find, traces of ilmenite, which they argue should have been present if ilmenite had been the source of the anatase per Olin's mechanism, given the imprecisions of medieval ink manufacture. Unfortunately, Olin (2003) does not address this specific criticism. It is conceivable that any ilmenite fragments would have been large enough to have settled out at one of the steps in the manufacture, so it would have been useful if Brown and Clark had actually prepared some ink from ilmenite and detected ilmenite in a line made from it. This issue deserves further investigation. By 2002, Brown and Clark should also have known about Weaver's 1976 article, if only from Washburn's mention of it in the 1995 reissue of VMTR (p. xxvi), and therefore should not have repeated the equally erroneous McCrone claim that anatase crystallites such as those found on the VM do not appear in nature. At the very least, as Raman specialists, they should have known and cited a 1997 paper by Enver Murad of the Bavarian State Geological Bureau, who shows that "Raman spectroscopy allows the detection of anatase in kaolin down to a concentration of 0.02%." Indeed, Murad shows a Raman spectrum for a kaolinite clay which, if added to Brown and Clark's spectrum for the uninked parchment, looks essentially like their spectrum for the inked parchment. Murad points out that the principal Raman line of anatase is so strong that for years researchers erroneously believed that it was a line of kaolinite itself, rather than of the small percentage of TiO2 that commonly accompanies it. Murad's findings suggest that Brown and Clark may be detecting only a very small amount of anatase, even within the miniscule targets analyzed with their microprobe. Brown and Clark do find with their Raman probe that the VM ink, unlike that of the TR, contains substantial amounts of carbon black. Unfortunately, they do not provide a Raman spectrum for iron gallotannate itself, so that their Raman technology by itself does not tell us whether or not iron gallotannate itself is present. They nevertheless conclude, from the fluorescence behavior of the VM ink, that it is not iron-based. It is generally accepted that prior to the development of the printing press, manuscripts were written in either carbon-based or iron gallotannate inks. A common means of differentiating between them is by the identification of erosion of the parchment or paper substrate by iron ions leeching from the iron gallotannate inks. This causes considerable discoloration and embrittlement of both paper and parchment, often leading to brown or yellow staining and, sometimes, considerable loss of the fabric of the manuscript. This trait is not evident in manuscripts produced with carbon-based inks, which are inherently more stable than iron gallotannates. Had the VM been drawn in a medieval iron gallotannate ink, a yellowing at the borders of the ink such as that seen on the map might have been expected. Knowing that such yellowing is a common feature of medieval manuscripts, a clever forger may seek to simulate this degradation by the inclusion of a yellow line in his rendering of the map. However, this study has shown that (a) the black ink on the VM is carbon-based making the natural occurrence of such a feature impossible and (b) that the VM shows no evidence of embrittlement of the parchment or associated parchment loss. The Brown and Clark paper provides no reference for this information, but Clark (private communication) has kindly referred me for details to the Iron Ink Corrosion Website by Elmer Eusman et al. In fact, however, Eusman himself states that "Aged carbon ink and iron gall ink are sometimes hard to distinguish from one another. Visual examination alone does not provide enough information to identify the ink" (barring actual corrosion, presumably). It therefore appears, contra Brown and Clark, that visible corrosion is not an invariable consequence of iron ink. According to Walter McCrone, all black medieval ink, not just iron-based ink, tends to develop a yellow stain around the inked lines over time. On p. 30 of his 1998 article, he states, "One thing we know about any black ink lines is that after a few hundred years, a narrow yellow border should be visible along the ink lines due to migration and yellowing of organic components of the ink; these stain the parchment fibers yellow. This is usually a requirement for, and a proof of, age." Thus, whether or not there is corrosion caused by the chemicals in the pigment, the organic components themselves (ie primarily gum arabic in the case of iron ink per Carvalho 1904) cause a yellow stain that gradually spreads. That this is not just a slip of McCrone's declining years is indicated by similar (though less detailed) statements in his 1988 Analytical Chemistry article: "The black upper line was drawn, and generally well-centered, over a broader yellow line. The latter simulates the natural diffusion and yellowing of an ink medium into the parchment which takes place normally over hundreds of years" (p. 1014), and, "The forger apparently knew that the medium in an old ink line diffuses very slowly over a few hundred years to cause a yellow border along its length" (p. 1015). Again, it is not the iron or even the gallo-tannic acid, but rather the medium (gum arabic dissolved in water that has since evaporated) that causes the stain he has in mind. This is not to say that the iron pigment itself cannot cause a stain, or even damage, to the parchment. However, unless McCrone is mistaken here, a (noncorrosive) yellow stain would appear with age whenever the same or similar organic medium is used to apply any pigment. Of course, McCrone has been known to be mistaken on other specifics, as for example about the existence of pigment-sized anatase particles in nature, or about the feasibility of calcination during the middle ages. However, until there is a published demonstration that he is wrong, the matter is unsettled. Eusman states that carbon ink was indeed made with gum, to keep the carbon in suspension, so that the same organic medium was sometimes present in carbon ink as in iron ink. Furthermore, the soot was at most 80% carbon particles, according to him, with the remainder including tarry materials. Tar would impart a yellow stain if it migrated with the gum into the fibers, so that if McCrone is right about the mechanism, a yellow stain could easily form with carbon ink. On the other hand, Eusman notes that pigments were often added to iron ink, to make it more visible as it was applied. Lampblack would serve this purpose, so that carbon in the ink does not itself prove that the ink was not primarily of the common iron type. Soot could even have become the dominant pigment if in a preservative effort, some chemical was applied that almost completely removed the iron. It should be noted that according to Carvalho (1904), isinglas (a pure form of gelatin made from sturgeon bladders), rather than gum arabic, was most commonly used to make carbon ink, at least in oriental recipes. Olin (2003, p. 6747) notes that McCrone's infrared spectroscopy of the ink did identify the presence of gelatin, though she notes that this could be "a result of hydrolysis of the collagen of the parchment by the acid present due to the deterioration of an iron gallotannate ink." In summary, the Brown and Clark argument that carbon in the ink, plus a yellow line with no corrosion, by itself demonstrates forgery, has not at present been substantiated. Clark (2004) critiques Olin's (2003) note in Analytical Chemistry. His principal argument is that the ink is carbon-based, and that therefore Olin's mechanism is irrelevant to the appearance of anatase in the ink. However, he still makes no mention of Weaver's finding of VM-sized anatase particles in kaolinite clay (1976), or of Murad's detection of even trace amounts of anatase in the Raman spectra of such clays (1997). Instead, he expressly states that such particles do not occur in natural weathered mineral samples, in direct contradiction to Weaver. Yet another mechanism to account for the presence of pigment-sized anatase crystals in the VM ink has been proposed by James Enterline (2002, Appendix). Enterline observes that the 1937 edition of Plenderleith's manual on conservation methods recommends cleaning manuscripts (presumably for mildew) with sodium hypochlorite, i.e. household bleach. In particular, if the ink is believed to be fragile, Plenderleith recommends first covering the document with tissue paper and brushing the bleach into the document through the tissue paper. Enterline proposes that if the tissue paper (e.g. old-style typewriter carbon-copy paper) had been whitened with modern anatase pigment and bound with casein, the bleach would soften the casein and some of the pigment could be transferred to the document. In particular, since the bleach would also soften the binder in the ink, which was commonly gum arabic, a type of glue, the anatase particles pressed into the ink would actually become bound into it. On drying these would be retained, while any that adhered to the paper would not. Enterline reports that when he tried this with an iron-tannin pseudo-ink on paper, using thin paper from a 1952 Bible that would have been bound with casein, he found that anatase pigment particles were retained by the ink, but not by the paper beyond the ink line. Enterline first proposed his very cogent mechanism at a 1977 cartographic conference, but it was not published until 2002, and has not yet been widely discussed. As stressed by Wallis (1990), this is an interesting feature that still deserves explanation. Figure 12 below shows the photo of the VM that accompanied McNaughton's article in the Smithsonian's 2000 Vikings volume. Most of the map's background in McNaughton's photo has a weird blue cast to it, even though the parchment is actually tan. The only exceptions are the unobtrusive patches on the back of the map, which show through brightly as yellow, and a faint smear of yellow in the western Atlantic below "Vinilanda." Evidently the map in this photograph is exhibiting the blue and yellow fluorescence under UV light that was described by Baynes-Cope. 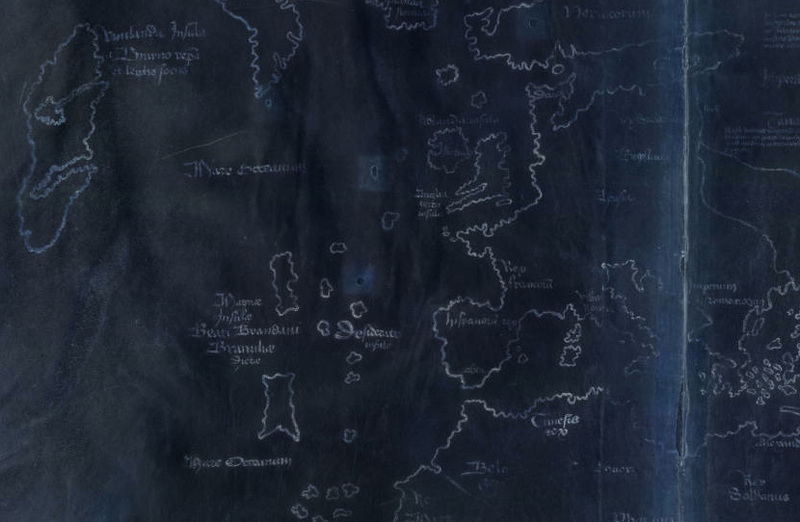 The modern parchment patches glow yellow rather than blue like the map, either because they were cured with different chemicals, or, as is more likely in light of the faint yellow smear in the Atlantic, because of the glue that holds them in place. It is therefore safe to conclude that McNaughton's photograph was taken under UV light, even though he makes no mention of this fact. Although the lines are indeed a little darker in Figure 12 than in the unenhanced Figure 2 above, they certainly do not have the dramatic increase in contrast that Baynes-Cope was expecting would occur in a normal iron gallo-tannate ink. One possibility is that this simply indicates that the misguided washing or flaking mentioned by numerous observers removed all but a trace of the iron pigment from the surface of the parchment. The McCrones (1974, p. 214) estimated that "well over 90 per cent of the black line" that must originally have been present had been removed. Most of the iron would have been in this black line. Figures reported by the Cahill group (1987) indicate that the VM ink typically contains only about 3% as much iron as that of the TR. But if "well over 90%" of the original black ink has been removed, then it should not be surprising if only well under 10% remains. Another possibility, favored by Baynes-Cope, is that the ink is not the common medieval iron gallo-tannate used on the TR and Speculum after all. Cahill et al. (1987 and in VMTR 1995) likewise conclude that the ink probably has an organic basis, and that the metals are just contaminants. (Paragraph corrected 9/13/05). One candidate for a non-iron-based ink, mentioned but not pursued by Baynes-Cope (1974, p. 210), is a carbon (soot) based ink, used, according to him, for ritual purposes by certain Jewish scribes in Germany. Despite the map's Christian agenda noted earlier, there is no reason the map copyist could not have been Jewish, or at least have used a Jewish ink recipe if that worked better for the minute map legends. It should be noted that Hebrew letters were drawn with significant hairline strokes that would require a particularly ductile ink, and that Basel itself was a center of Jewish bookmaking from the earliest days of printing (Prijs 1964). The traces of iron, copper, and even titanium that are present could then simply be residues of a mineral-based ink from an unwashed inkwell. I would suggest that future studies of Medieval inks for comparison to the VM include at least a few Torah scrolls. Several photographs of the VM and TR, including Figure 2 above, may be viewed by navigating to http://beinecke.library.yale.edu/dl_crosscollex/, and searching for Vinland Map. Figure 12 above is clearly based on color photo #39002037848968, while the older B&W photos 39002032765142, ...159, ...407, ...415, ...431, ...449, and ...456 were all taken under the same conditions, since the lines are darker than the parchment, while the patches and slug-shaped blob under Vinland are lighter than the parchment. However, it should be noted that according to Ellen Cordes, Head of Public Services at the Beinecke Library, there is no record that any of these was taken under UV light (personal communication, 2/13/05). The only one of these photos which is actually identified as shot under UV light is the old B&W #39002032765399, in which the patches and "slug," as well as the lines, are distinctly darker than the parchment, unlike Figure 12. It is conceivable that Figure 12 and #...399 are both UV, but using different wavelengths, or that Figure 12 is really infrared. In order to clarify the important issue of how the map really looks under UV, it would therefore be very useful if Yale would add detailed modern color photos like Figure 2 above, taken under UV and IR light of appropriate wavelengths, along with similar photos of say the first page of the TR and SH. As noted above, Donahue, Olin and Harbottle (2002) determined the radiocarbon age of a sliver of the parchment taken from the bottom of the map to be AD 1434 � 11 years. Although this confirms that the parchment is indeed as old as the SH and TR, it does leave open the possibility that a modern forger found two connected pages of blank parchment in the SH+TR or a similarly dated volume, and drew the map on these. However, this possibility is rather remote, since the wormholes in the VM parchment strongly indicate that it originally was at the front of the SH+TR volume. Manuscripts, including the Yale TR itself, often do have blank pages at the back end, and books often contain a blank page or two at the front. However, a blank leaf at the front of the first quire would ordinarily be connected to a written leaf at the back of the same quire. The bookbinder might have added a bifolium of blank flyleaves at the front, but ordinarily these would have been in a much coarser material than was used for the manuscript itself. Since the writing on the map has been actually chewed through by the bookworms, the hypothetical forger would have had to have acquired live bookworms per Lopez (PVMC, p. 31 n. 1), and placed them together with the freshly drawn map in its original configuration between the SH+TR front cover and the SH in order to generate the aligning wormholes. He or she then unaccountably rebound the VM+TR separately from the SH in order to prevent the alignment of the carefully made wormholes from being noticed except through the impulse purchase of the SH on Marston's part, and then even took the trouble to conceal the aligning holes in the original front cover with a paste-down. It would be far simpler simply to believe that the map is a genuine 15th century production. One unexpected finding of the Donahue et al. study was that some 20-30% of the mass of their sample was an organic substance of modern (post-1950) origin. It was only after removing this substance with acetone that they obtained their medieval date on the parchment itself. Apparently this modern substance is a varnish or similar material applied in an attempt at preserving the map sometime shortly before it was first shown the the British Museum. McCrone, who was not aware that the map had undergone such a treatment, noted that under his initial examination of the map with a stereo microscope, he found that "The black ink line was bordered by a yellowish discoloration which was at first assumed to be the stain normally resulting from discoloration by ink components having migrated into the fibers over time. During sampling, however, this yellow discoloration was observed to have body, unlike a stain. It could be removed as tiny fragments with a fine-tipped tungsten needle while viewing the map with a stereo microscope at 20-60X." (1988, p. 1011) After finding tiny anatase clusters in these fragments, he concluded (p. 1015) that a post-1917 forger painted the yellow line and then added the black line on top of it in order to give the manuscript the appearance of age. However, this paint-like property of the yellow line that McCrone found to be so suspicious could simply be the effect of the modern organic substance that Donahue et al. found had been applied to the map post-1950. If the anatase particles in the ink lines did just fall off the ceiling as suggested by Cahill, it could account for why they nevertheless seemed to be embedded in the ink, as noted by McCrone technician Anna Teetsov (NOVA 2005). It would therefore be useful to see if similar fragments can be lifted off the map's uninked areas. In a new article in Archaeometry, Garman Harbottle (2008a) argues that the calcite crystallites found by McCrone in the map's anatase-bearing particles are inconsistent with 20th century synthetic anatase production, since this involved hot sulphuric acid that would have destroyed any calcite. Furthermore, synthetic anatase pigment commonly contained substantial barium sulphate, which McCrone did not detect on the map. He argues that a natural origin for the anatase, such as kaolinite per Weaver (1976), or even lateritic earth pigments such as umbers, sienas and ochres, is much more likely. Towe et al. (2008) reply that the calcite found by McCrone was a simple mechanical mixture that could have occurred after production of the anastase, citing Figure 3 of McCrone (1988). However, Figure 4 of the same article shows what McCrone takes to be anatase and calcite intimately mixed in a composite particle similar in size and texture to the type found by Weaver in kaolinite. This impasse could perhaps be resolved by examining some of kaolinite composite anatase particles, to determine whether these are "cemented" together with calcite, and if so, whether McCrone's methods would have detected this calcite. At the same time, it could be determined whether aqueous suspension is adequate to achieve the degree of separation of the anatase composites from the clay overburden observed by McCrone on the VM. Towe et al. also argue that at least some early synthetic anatase was 99% pure, without added pigments like barium sulphate. Another recent paper by Larsen et al. (2006) studies the condition of the map, making recommendations for its conservation. It is their opinion from their close examination that the map was made from a single bifolium, rather than from two separate pieces of parchment. In a letter to Radiocarbon, Harbottle (2006) notes that the modern substance found to be adhering to the map by Donahue et al. (2002) is likely nitrocellulose, a.k.a. guncotton, a highly inflammable substance. He warns that further heat-producing investigations such as Raman laser probing could cause the map to ignite or even explode. Kirsten Seaver's 2004 book, Maps, Myths, and Men: The Story of the V�nland Map, contains a wealth of information about the Norse and cartography as they relate to the Vinland Map, and should be carefully studied by any serious follower of the debate. However, she fails to make a convincing case that the VM is a forgery, let alone that Joseph Fischer was the forger. Seaver takes as given that the 1974 McCrone Associates finding of pigment-like anatase crystals at isolated points in the ink is conclusive evidence of forgery. According to her, the �smooth shape and narrow range of particle size� of these particles �could only be achieved through a modern process involving precipitation followed by calcination at a very high temperature� (p. 190; emphasis added). As noted above, Jacqueline Olin announced in 1976 that anatase in fact precipitates as part the medieval process of ink-making provided the titanium-rich iron ore ilmenite is used to make the copperas, while George Painter pointed out in 1995 that the temperatures required to alter the particle size are not as high as those routinely achieved in the middle ages for iron smelting. There is therefore nothing intrinsically �modern� about the techniques required to manufacture such particles. On p. 155, Seaver presents the 1995 rerelease of the VMTR as if it were an arbitary decision based on no new evidence. Later (pp. 190-9), she does make reference to the studies of Cahill and Olin, but then dismisses all the scientific considerations in VMTR95 as "misinformation" (p. 197). To her credit, Seaver does provide a fleeting mention of sedimentary anatase on p. 199. This may be the only published mention of the issue by a map critic in a scholarly article or book, aside from Clark's (2004) unelaborated assertion that there is no such issue [prior to Towe et al. (2008)]. However, she does not mention that the relevance of this is Charles Weaver�s 1976 discovery, cited by Washburn in VMTR95, (see above) that anatase crystals of essentially the same shape and particle size that the McCrones found in the VM ink also appear naturally in kaolinite clays. Instead she merely quotes Kenneth Towe to the effect that ��sedimentary occurrences of anatase are always accompanied by - and subordinate to - clay minerals that have not turned up in the map�s ink�� (2004: 199) As noted above, however, anatase aggregates of the 5-10 micron size found by the McCrones could easily be separated from the bulk of the clay through the action of water, grinding with a mortar and pestle, or even wind. The McCrones even found silicon and aluminum associated with these aggregates, suggestive of some adhering kaolinite, and even found other particles in the ink that they identified as being consistent with clay. Seaver makes no mention at all of James Enterline�s suggestion in his 2002 book, mentioned above, that anatase could even have been transferred to the map from modern tissue paper in an effort to clean it of mildew. This is all the more remarkable, given the fact that she herself has written a review of the book in question (Seaver 2002). To be sure, however, the thrust of the new book is cartographical and historical, rather than technical. Seaver�s strongest cartographic/historical criticism of the map remains her very interesting claim, noted already in her 1995 article, that the minute Vinland caption contains an apparently fatal anachronism. In her 1995 article in The Map Collector, Seaver called renewed attention to an apparent problem of the VM captions: In Skelton's translation, the VM repeatedly claims that Vinland was discovered by the "companions" (socii) Bjarni and Leif. In Skelton's interpretation, this means that Bjarni and Leif actually shared a voyage [VMTR 139-140]. However, although the Greenlanders' Saga states that a Bjarni Herj�lfsson first sighted the new lands, thereby leading Leifr Eiriksson to share in their discovery by actually visiting them several years later, there is no record there of their ever having actually sailed together (Perkins 1974, p. 201). Thus, although they acted as partners in exploration, they never actually explored in company. Eric the Red's Saga instead states that it was Leifr himself, not this Bjarni, who first sighted the new lands without at first going ashore. It does state that a Bjarni Gr�m�lfsson later visited Vinland, but there is again no record that he ever sailed with Leifr (ibid., p. 204). Since the two Icelandic Sagas already contain contradictory details, it would perhaps not be entirely surprising if Bishop Eric Gnupsson found yet a third, slightly different version of the story circulating in Greenland itself. The issue of Leifr and Bjarni allegedly sailing together was in fact discussed extensively at the 1966 VM conference, and caused Viking scholar Gwyn Jones, for one, "no anxiety" (PVMC, p. 127). Erik Wahlgren entitled his contribution to PVMC "The Companions Bjarni and Leif," but found no more problem with the map's having them sailing together than with its conflation of Helluland, Markland and Vinland together into one tripartite "Vinilanda." Through a remarkable exercise in historiographical research, however, Seaver discovered that "The first time such confusion took place was not around 1440, however, but in 1765, when it afflicted David Crantz, a German Moravian Brother, who relied on secondary literature in non-Scandinavian languages for information he did not know how to process in writing his two-volume Historie von Gr�nland (History of Greenland)" (Seaver 1995, p. 33). Assuming that Skelton's translation is correct, Seaver's discovery would appear to a literary "smoking anachronism" that proves the VM to be a forgery, quite apart from any physical evidence. Oddly, however, no one seems to have ever questioned Skelton's original translation of the the crucial term socii as "companions." Although the Oxford Latin Dictionary does give the first definition of the noun socius as "one who accompanies another, a companion, comrade," the second definition is "one who shares a responsibility, possession, etc., a partner, colleague." As an adjective, the first definition is "keeping company with another," but the second is "living or acting in partnership." So what, if anything, did Bjarni and Leif share? The Greenlanders' Saga is quite clear that they shared the credit for the discovery of Vinland: Bjarni did not fully discover the new territory because he never went ashore, yet Leif would never have set out without Bjarni's information. It was only through their collaboration that the discovery was complete. Thus, the Vinland caption should in fact be read "Island of Vinland, discovered by Bjarni and Leif acting in partnership." Note that the caption not only gives first billing to Bjarni, but also gives his name a fancy majuscule letter, while Leif's name is all minuscules, so that the author evidently viewed Bjarni's contribution as even more important than Leif's. Once it is recognized that there is no claim on the VM that Bjarni and Leif ever sailed together, the appearance of such a claim in Crantz's book, as discovered by Seaver, becomes irrelevant to the map's authenticity. Most of the new non-technical arguments Seaver puts forward in the book fall flat of their own accord, however. For example, she maintains repeatedly that the spacing of the lines in the small captions is metric, being exactly 2.0 mm per line (pp. 173, 363). In fact, the spacing in the Vinland caption, measured at three different points on the life-sized photograph in VMTR, averages slightly over 2.1 mm per line. While some lines are essentially 2.0 mm apart, others substantially exceed this, so that the spacing cannot be called exact at all. One �obvious shortcoming� of the VM that she stresses on p. 295 is certain �inconsistencies in the lettering.� This is an allusion back to her p. 173, where she reports a communication from the American medievalist F. Donald Logan, who had alleged that �ae� and �� are inconsistently both used in the legend �Magn� Insul� Beati Brandani Branzili� Dictae.� In fact, the last word does use the same diphthong form as the other words in this caption, as may easily be ascertained from the photo in VMTR or from Figure 5 above. As an historian, Seaver should have known better than to have failed to have checked a primary source, and in particular, one that is so readily available. Seaver makes no mention of Saenger�s far more interesting objection to the use of � in this caption, which has already been discussed above. Unfortunately, Seaver underutilizes an important secondary source as well, namely the 1966 Proceedings of the Vinland Map Conference (PVMC). In particular, she overlooks Vsevolod Slessarev�s remarks, where he clarifies the meaning of the expression �ad orientem hiemale[m]� in the long Vinilanda Insula legend on the VM, and similar expressions that occur in the TR. Most authors, including Skelton and Painter, had assumed that this expression, which literally means �toward the wintry east,� would mean northeast, since the north is cold and wintry. On p. 4 of her book, Seaver gives the full text of Skelton�s translation of the long Vinilanda legend, with the announcement that it is erroneous and that a new and correct translation, that will clear up important confusion that Skelton�s mistranslation had engendered, will be provided in her penultimate Chapter 8. In Skelton�s original translation, Eric Gnuppson, whose title is given as �legate of the Apostolic See and bishop of Greenland and the neighboring regions,� spent a long time in Vinland, �and later returned northeastward toward Greenland and then proceeded in most humble obedience to the will of his superiors.� (...postea versus Gronelanda[m] redit / ad orientem hiemale[m] diende humillima obediencia superiori volu[n]tati processit,� VMTR 140). While Seaver�s inventive interpretation of northeast as northwest would account for why Eric never returned to Iceland, Slessarev (PVMC: 114-118) already had a far simpler solution. He, citing a communication from Dr. Marian Plezia in Poland, pointed out that while most of us are accustomed to the sun rising in the east and setting in the west, with only minor seasonal deflections, in northern latitudes this seasonal deflection is so extreme as to make the winter and summer sunrises and sunsets entirely different directions than the equinoctial sunrises and sunsets. In some modern Polish dialects, the �wintry east� in fact therefore means southeast, since the sun rises far south of due east in the winter, while northeast is the �summery east.� Plezia even provided him a quotation from an early 16th century Polish chronicler who thus uses �toward the summery east� (�versus orientem aestivum�), in Latin no less, to indicate what in the context can only be the northeast direction. Not only does Slessarev�s reading not require Seaver�s interpretation of �northeast� as �northwest,� but it is also in perfect accord with Einar Haugen�s hypothesis, presented at the same 1966 conference, that in order for Eric's fate and the data on the Vinland Map to have escaped Iceland and Scandinavia, Eric must have sailed directly from Greenland back to his superiors in the Apostolic See in Rome, i.e. southeasterly, thus bypassing Iceland entirely (PVMC 141-2). It also clears up the otherwise puzzling use of the same term in the TR (Seaver 2004: 289-90). The fact that the VM correctly uses such an arcane expression is in fact strong evidence in its favor. Although Seaver is completely wrong to suppose that Bishop Eric sailed from Greenland to the Samoyed Islands depicted at the far upper right of the VM, her researches do provide clues that clear up three of the big mysteries of the VM. The first mystery is the identity of the "Samoyed Islands" themselves, which Armando Cortes�o had suggested at the 1966 conference might be Japan (PVMC, p. 15-18). The second mystery is the identity of the "Great Tartar Sea" ("Magnum mare Tartarorum") which separates the Samoyed Islands from the mainland on the right side of the map. Skelton (VMTR 136) proposed that this was probably a vague concept of the Caspian Sea, despite the presence of another, inland Caspian Sea just east of the Black Sea. The third mystery relates to the controversial caption under "Thule Ultima" which reads, "The Tartars affirm beyond doubt that a new land is situated in the outermost parts of the world, and beyond it no land is found by only the ocean sea" (Skelton in VMTR 136). At the 1966 Vinland Map Conference, Boleslaw B. Szczesniak had challenged the expression "new land" (nova terra) as anachronistic, on the grounds that it was a strictly post-Columbian term that could refer only to the new American discoveries (PVMC, p. 96). The first clue Seaver provides, citing L.-A. Vigneras as her source, is that �The Samoyeds still occupy their ancient territories on the Siberian mainland (on the shores of the Kara Sea and on the Yamal Peninsula) as well as on two large islands, namely in southern Novaya Zemlya and on Vaigats Island� (283). The second clue she provides is that a 1611 map by the Flemish cartographer Jodocus Hondius �features a Mare tartaricum just east of Nova Zemla and above the rest of Asia� (p. 306). The elusive Boreal Samoyed Islands, the Insule Sub aquilone zamogedorum, then, are not Japan at all, but rather Novaya Zemlya, which in fact is a pair of islands separated by a slender channel. Novaya Zemlya is the perfectly Old World New Land mentioned in the caption, beyond which there is no land (to speak of) but the (Arctic) ocean sea. Lying well above the Arctic Circle, it is truly �under the dark cold north,� as Seaver renders sub aquilone. The Great Tartar Sea separating the Samoyed Islands on the VM from the mainland is then the Kara Sea, just as depicted by Hondius, and not the Caspian at all. Furthermore, the Tartartata fluvius depicted on the VM as emptying into the Arctic would then be either the Ob or the Yenesei, the two great rivers of Tartary that empty into the Great Tartar/Kara Sea. The Postreme Insule or �Last Islands� illustrated beyond the Samoyed Islands are then Severnaya Zemlya (�Northern Land�), and/or possibly even the New Siberian Islands. The VM compiler was evidently clueless as to where these features should go, and hence situated them �in the outermost parts of the world,� as the Thule Ultima caption indicates, but with the navigational disclaimer above them, �Lands not sufficiently explored. They are placed among the northern ice and concealed by it� (VMTR 135). Considering that the VM compiler placed Sweden in Poland (as had Bianco), Mount Sinai in Somalia, and Basra (of present-day Iraq) in South Africa, it should not be too surprising to find Novaya Zemlya where Kamchatka or Japan ought to be, and the Kara Sea about where the South China Sea should go. These vague �New Lands� in the east are drawn to nicely balance the new lands of Greenland and Vinland in the west, and hence drive home the message of the map that there is new turf in all directions just waiting for conversion to Christianity, with no claim to geographical precision. Beregovoy (undated) notes that Samoyede literally means �self-eaters� in Russian, and that hence they are known today by the less disturbing name Nenets, which means �human being� in their own language. Whether �self eating� was a true practice, or just an ethic slur or even a mistranslation of something completely unrelated, it is interesting in this respect that the Nenets are considered to be a Mongolian people, and that paragraph 13 on the TR reports that on one occasion when food was running desperately short, Genghis Khan ordered his men to eat one man in every ten (VMTR: 64). Today Samoyed survives as the name of an Arctic dog originally bred by the Samoyeds (see www.samoyed.org). Be sure to check out Beregovoy�s page of photographs of the Samoyed homeland at http://www.samoyed.org/vladarticlepics.html. Having satisfied herself that the VM is a modern hoax, Seaver goes on to expand on her earlier theory that the eminent cartographer Father Josef (or Joseph) Fischer, S.J., was the culprit. As she put it in a 2003 article in the Toronto Globe and Mail, "The map's brilliant cartographical conundrums, as well as its unintentional historic and linguistic mistakes point strongly to the only man capable of creating such a work between the 1920s and 1957, namely the German-Austrian cartographic historian Father Josef Fischer, who had ample opportunity to observe the Nazis' relentless twisting of cartography to fit their claims to a Greater Germany that was theirs by ancient 'Nordic' right. He wanted to corner the Nazis: If they accepted his bogus map, they would have to accept the presence of the Roman Church in the New World" (Seaver 2003). One would hope that there is sufficient real evidence that the world is more complicated than Nazi dogma would have one believe, to make bogus evidence superfluous. Even if the VM is somehow a forgery, her case against Fischer is almost entirely circumstantial. believed Irish monks once settled in Iceland (p. 300). had rigid beliefs (p. 303). could not read Danish (p. 303). discovered the 1611 Hondius map with its Mare Tartaricum (p. 306). occasionally made errors (p. 311). had preconceived notions (p. 314). defined North America to include Greenland (ibid.). was persecuted by the Nazis (354-70). The only non-circumstantial �evidence� that Seaver can muster against Fischer is his handwriting, of which she offers two specimens (Figs 27, 28, pp. 365-366). Seaver notes that Fischer makes a �horizontally looped and somewhat impatient �d� very similar to the one that occurs on the V�nland Map.� (p. 364). Indeed, in Figure 5 above, the �d� in �Brandani� does have such a horizontal loop. However, Seaver has once again failed to check her primary sources. If she had consulted the facsimile of the now indisputably genuine TR itself in VMTR, she would have found that its �d�s are often made with essentially the same loop as on the VM, as for instance in the word fidei in Figure 8 above. Although a looped �d� was evidently a sufficiently common medieval practice that it occurs in the first authentic MS that comes to hand, the looped �d� in the VM and TR is in fact very different from Fischer�s: Fischer�s loop, for example in bedenksamen and sondern in Seaver�s Fig. 28, is literally horizontal and ends in mid-air, without ligating to any letter but �k� (as in Feldkirch). The looped �d�s in Figures 5 and 8 above, however, instead come down to ligate with the vowel that follows. A much better case could thus be made, on the basis of d-loops, that the VM and TR were written by the same hand, than that it was Fischer who scribed the VM. As it happens, the VM �d� does not consistently have this loop, as for example the internal �d� in �Desiderate� in Figure 5 above. But then the same is also true of the TR, as for example in �Unde� in Figure 8 above. Fischer, on the other hand, always loops his non-capital �d�s in Seaver�s two specimens. Fischer thus lacks the common inconsistency in this respect of the VM and the TR. Seaver goes on to remark, �Equally idiosyncratic and recognizable (but not found in the V�nland Map) is the peculiar �flagged� capital �D� found in his letter to Bj�rnbo [i.e. her Fig. 28]� (p. 364). But if Fischer�s capital �D� is not found in the VM, that should, if anything, be evidence that he did not write it! Finally, Seaver notes, �Frequently, Fischer used a short line above a letter to denote a missing �n� or �m.� This mark is also used on the V�nland Map� (p. 364). In fact, this is a very common medieval abbreviation (see Capelli 1990). The fact that it appears on the VM merely proves that the VM is consistent with normal medieval practice. If Fischer also used it, it would not have been an unnatural affectation for a medievalist like himself. Even assuming, for the sake of argument, that the VM is somehow a forgery, positive evidence that Fischer was not the forger is in fact found in Fischer's 1902 book, Discoveries of the Norsemen. In Chapter 1, Fischer is adamant that the only accurate account of the discovery of Vinland is that of Erik the Red's Saga, in which Leif makes the discovery single-handedly. The VM, on the other hand, takes the position of the Greenlanders' Saga, in which Leif must share the credit with his partner in exploration, Bjarni. It is fortunate that Seaver reserved her �case� against Fischer for her last chapter, so that it would not detract from the rest of her often very useful book. Several of the details that she uncovers actually work in favor of the map. One particularly interesting morsel that Seaver turns up is that in Fischer�s 1902 book on The Discoveries of the Norsemen in North America (English translation 1903, p. 35), he reports that Nordenski�ld had once shown a copy of a remarkably accurate pre-Columbian map of Greenland to another cartographer, who, on the basis of its accuracy alone, �stoutly declared it to be a forgery of the nineteenth century� (p. 313). Nordenski�ld evidently dropped the matter, but Fischer himself did not find it surprising that such a map could exist, on the basis of his extensive knowledge of eleventh through thirteenth century Norse explorations. It would be tempting to believe, from Seaver's account, that Nordenski�ld's map might have been the VM itself, in existence at least 15 years before the development of modern anatase pigment. However, Fischer himself (1903, p. 35) makes it clear that the map in question was one of the Northern Regions by Donnus Nikolaus (or Nicolaus) Germanus, either the one drawn after 1466 in Fischer's plate 2, or else the one drawn about 1474 in Fischer's plate 4. Both these maps follow Clavus (circa 1430) in their reasonably recognizable depictions of southern Greenland, but unlike the VM, attach Greenland like a peninsula to what may be the polar icecap. In Fischer's black and white reproductions of these maps, Greenland appears to be a group of islands separated from the icecap by a body of water. However, on comparison to the Germanus maps of the mainland, what appear to be separating waterways are in fact stylized mountain chains. One supposed anachronism of the VM has been its omission of the "Earthly Paradise" that was routinely inserted into medieval maps, including Bianco�s. But Seaver notes that the fourteenth century travel accounts of Franciscan friar Odorico da Pordenone "had reinforced Marco Polo�s information that no 'Earthly Paradise' could be found there" (p. 312). The VM is therefore merely reflecting an already well-established viewpoint in this respect. Another supposedly non-medieval characteristic of the VM, raised for example by Helen Wallis (1974: 186), is its elongation of the typically circular map of Bianco et al. into a distinctly elliptical shape. But Seaver comes to the map's rescue here as well, with the information that already in 1447, there was at least one other ellipsoidal Planisfero Terrestre (p. 325). Although double inking, once with a pale yellow ink containing telltale modern anatase, and then with a slightly narrower black line to give the appearance of age, has always been a mainstay of the McCrone argument against the validity of the map, Seaver readily agrees with many of McCrone�s critics that such a double inking is highly implausible (pp. 190, 363). A few of Seaver�s other remarks should not go unchallenged, however. Seaver argues repeatedly (pp. 11, 36) that the island on the VM must represent only Vinland. Most authors have cogently assumed, on the other hand, that its three lobes represent the Sagas� Helluland (Baffin Island), Markland (Labrador), and the original Vinland (Newfoundland), and that �Vinland� is simply used on the map as a collective term for all three. This is not to say that �Vinland� might not later have come to include lands further south, including Nova Scotia and the St. Laurence estuary, however. Seaver states that the spindle whorl found at L�Anse aux Meadows specifically demonstrates the presence of women at the settlement (pp. 39, 48). However, while spinning may normally have been women�s work back in Greenland, there is no reason to think that men wintering over far from home would not have done their own cooking, sewing, washing, and even spinning. Seaver repeatedly assumes that for the VM to be genuine, its information about Greenland and Vinland must have been communicated from Scandinavia at the time of its compilation (pp. 71, 136-9.) However, at the 1966 Vinland Map conference, Wahlgren, Haugen, and Oystein Ore all argued that it more likely was based on a 12th century report by Eric Gnuppson, which had lain in the Vatican archives until the 15th century Council of Basel. Seaver maintains that the pair of wormoles in Norway and just below Thule Ultima do not penetrate into the SH, while the small pair beneath Greenland and just off the Asian coast do (p. 178). My own observation when I examined the materials was just the opposite: The Norway hole does penetrate as closely as may be expected given the missing four quires, while the tiny Greenland pair does not. And finally, Seaver faults the VM for depicting Scotland "on a straight north-south axis with England, in defiance of the fifteenth-century Ptolemaic convention of pushing Scotland far to the east" (p. 294). In fact, the Ptolemaic depiction of Scotland extending far to the east of England dates to Ptolemy's own second century A.D. It appears in 15th century Ptolemaic maps, such as Bianco's conic projection, only because these are trying to reproduce Ptolemy's ancient view of the world as faithfully as possible. In actual fourteenth and fifteenth century maps, such as the Laurentian Atlas of 1351 (VMTR plate VIII), or Bianco's own VM-like 1436 planispheric world map, the coast of Scotland is very much as it appears on the VM. Seaver concludes in her Toronto Mail article that, "Competent scientists, historians, and cartographic experts have repeatedly shown that the Vinland Map is a fake" (2003). This statement seems to imply that any scientist, historian, or cartographic expert who is not persuaded that it is necessarily a fake is ipso facto incompetent. NOVA's The Viking Deception: Science Fact or Science Fiction? The Granite Productions/WGBH/NOVA program on the Vinland Map, entitled "The Viking Deception," which aired in the US on Feb. 8, 2005, provided much good information and some misinformation. On the positive side, the show put faces on several of the scientists and historians who have worked on the VM: Anna Teetsov, the McCrone Associates technician who actually removed the famous anatase samples from the map; Thomas Cahill, the Davis chemist who used a particle accelerator to determine that there is in fact far less titanium, and therefore anatase, than the McCrone report would lead one to believe; Garman Harbottle, who was a member of the group who dated the parchment to the first half of the 15th century; Robin Clark and Katherine Brown, who confirmed the McCrone detection of anatase using Raman spectroscopy, and Kirsten Seaver, the historian whose new book on the VM is discussed above. Some very amusing footage illustrates the indignation of Columbophiles who felt that the map was robbing Columbus of his claim to fame, while computer-generated special effects show how the VM+SH+TR must have been originally assembled in order for the worm holes to align. The program makes it clear that Enzo Ferrajoli, the dealer from whom Witten bought the VM, was convicted of stealing over a hundred volumes from the library of La Seo, the cathedral of Saragossa in Spain. This raises the interesting possibility that the TR and SH, with or without the VM, may have been stolen from that or some other library by Ferrajoli himself. As noted above, however, this would not reflect one way or the other on the authenticity of the map, but could mean that Yale is not in fact its rightful owner. Retired rare book dealer Diego G�mez Flores recalls in an interview a conversation he had with Ferrajoli in the early 1950s, in which Ferrajoli boasted that he had recently bound the VM together with the TR, in order to pass them off as belonging together and thereby increase their value. If the rebinding was in fact done by Ferrajoli after World War II, despite its c. 1900 appearance, that would account for the fibers of modern plastic that were detected by Baynes-Cope in the spine of the reassembled SH. It may well then have been Ferrajoli himself who patched the holes and applied the post-1950 acetone-soluble substance detected by Harbottle's group. G�mez did not imply that Ferrajoli had forged the map, or knew it to be a forgery, however. Although early in the show the narrator states that scientists are divided on the authenticity of the map, and Cahill and Harbottle are quoted favorably on the issue, the title of the program, "The Viking Deception," makes it clear that its position is that it is a fake. Considerable time is given to Seaver's shaky thesis that Josef Fischer forged the map, complete with file footage of Nazi troops overrunning Austria and Seaver's Figure 28 showing how Fischer looped his d's. Unfortunately, the producers did not bother to actually compare the d-loops on this visual to those on either the VM or the unquestionably medieval TR. Such a comparison, as is performed above, would have demonstrated the vacuousness of this argument. Even if the map is indeed a "Deception," the title of the program itself is a misnomer, since the map purports to be a 15th century Swiss production, and not Viking at all, or even Scandinavian. According to Webster's Second Unabridged Dictionary, a Viking is "one belonging to the pirate crews of the Northmen who plundered the coasts of Europe in the 8th to 10th centuries." Although the shared discovery of Vinland by Leif and Bjarni as mentioned on the map does date to the end of the Viking era, the information about Greenland and Vinland on the map purports to have come from the 12th century Bishop Eric Gnupsson, who can hardly be considered a Viking. The narration at the beginning of the show misleadingly claims that in 1957 the VM was the first evidence that Columbus was not the first European to discover America. Although this may have been taught in the lower elementary grades and fervently believed by many individuals, the Norse discovery of America was in fact well known from the Saga accounts for over a century before the map appeared (Perkins 1974: 199). This was clear even in a sixth-grade history book I recall reading in 1956-7. The program devotes considerable footage to the production of modern anatase paint, but never mentions the fact that pigment-sized anatase particles such as those found by McCrone Associates on the map occur naturally in kaolinite clays, and probably in other clays formed by weathering. Despite the fact that I called producer Jonathan Dent's attention to this fact in a background interview as the show was being produced, neither Clark nor Brown was pressed on this issue during their interviews. Katherine Brown asserts that Raman spectroscopy is "absolutely accurate" in its identification of pigments. Brown and Clark (2002), however, in fact gave no illustration or reference for the spectrum of known iron gallotannate ink. For all we know, it may be indistinguishable from the evidence of carbon that they found in the black line. The program naturally dramatizes the events it relates. The viewer understands that those aren't real Vikings sailing the ocean, and that the slick, shifty character trying to sell the map isn't really Ferrajoli, but just an actor portraying him. The viewer may not realize, however, that the map that the actors are handling and examining is not the real Vinland Map, which in truth is too pale to show up well, but rather just one of two or more mock-ups of it. Some of these may be digitally-enhanced prints on pseudo-parchment, but others are actually hand-drawn, probably by the calligrapher Brody Neuenschwander: On the real VM, the Vinland caption was read by Skelton as beginning, "Vinilanda Insula." It may be seen in the blowups of Figures 1 and 2 above that there are four vertical strokes between the V and the l, connected by diagonals, so that it is not inconceivable that this should be read "Vimlanda Insula." 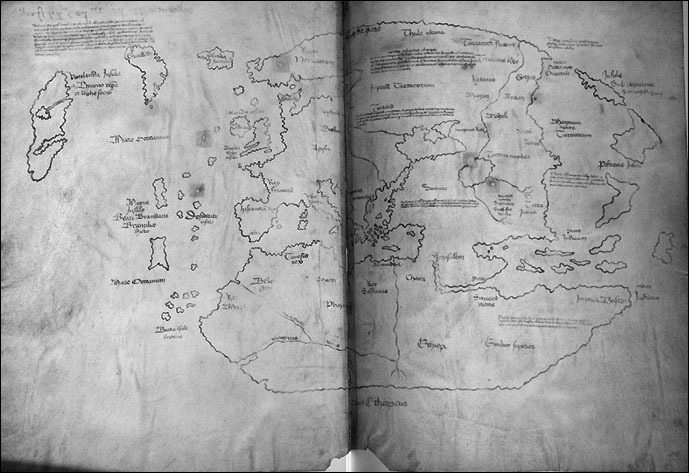 However, the closeup of the map in the hands of the actors on one occasion clearly reads "Vinlanda," while on another it clearly reads "Vimlanda," the latter with two rounded arches on the "m" that are not present on the real map. It would have been useful if the program had taken a moment to explain how pale the real map is, and that what the viewer is seeing is not really it. Science drama degenerates into science fiction, however, when the map is examined at the British Museum in 1967 under "ultraviolet" light. Unlike the TR, which shows black ink on a lighter background under the "ultraviolet" light, the VM's background is shown as going dark blue, while its inked lines glow warmly, as in Figure 13 below. The viewer is told, "The tests showed that inks from the Tartar Relation and Speculum Historiale absorbed the ultraviolet and therefore appeared deep black. But the lines on the Vinland Map did not appear black; instead, they fluoresced." The viewer infers that this elementary scientific examination demonstrated already in 1967 that the VM is so different from a normal medieval manuscript that it should never have been taken seriously from that point on. Same image as Figure 2, with colors inverted. The only problem with this "scientific evidence" is that Figure 13 is not a real UV image of the map at all. It is in fact just an enlarged portion of the same image as Figure 2, with its colors digitally inverted to create a color negative. Evidently NOVA created their "ultraviolet" image in the same way. It would have been trivial for NOVA to have asked Yale to have a real UV photograph taken if there was none on file clearly identified as such. But instead, the producers of NOVA's program resorted to what can most charitably be called science fiction, by literally fabricating evidence against the map. As noted above under Baynes-Cope and Fluorescence, the map was indeed found to behave peculiarly under UV light, but only to the extent that the lines did not appear as dark as they were expected to. Figure 12 above is very likely a true UV image of the map, even though Yale has no indication that it was taken under UV light. In another, old B&W photograph which is identified as UV, both the lines and the patches are darker than the parchment, so that there is at present considerable uncertainty as to the true appearance of the map under UV. Nevertheless, in both of these photographs the lines are clearly darker than the parchment, and neither looks anything like Figure 13 above. Toward the end of the program, chemist Michael Henchman of Brandeis University raises a brand-new hypothesis about the map: Henchman asserts that the VM's ink is on top of, rather than under, the modern acetone-soluble substance detected by the Harbottle group, and that the map is therefore a fake. According to him, medieval parchments were prepared for writing by first coating the surface with an unspecified substance. He postulates that a modern forger must have obtained a genuine but written-upon parchment, chemically stripped off its original coating and writing, and then added a new coating before drawing the map, in order to restore its genuine appearance. It is hoped that he will write up the details of how he knows the ink is on top of the modern substance, and of the nature of the medieval coating material, in the near future. Despite beginning with the balanced assertion that scientists are divided on the authenticity of the map, the NOVA program concludes with a series of sound bites from Clark, Brown and Henchman, all pronouncing it a fake. And so the case is "closed." The anatase titanium dioxide particles found on the Vinland map by Walter and Lucy McCrone (1974, 1988, 1998) and by Katherine Brown and Robin Clark (2002) are consistent with naturally occuring anatase particles appearing in kaolin clays per Charles Weaver (1976) and Enver Murad (1997), could have been produced with medieval technology per Jacqueline Olin (2000, 2003), or could even be due to the conservatorial transfer mechanism proposed by James Enterline (2002). Although the unusual VM ink deserves further study and comparison, there is at present no technical reason to reject its purported age. Despite his best efforts at discrediting the Vinland Map, Douglas McNaughton's widely-read paper in the Smithsonian's recent Vikings volume (2000) actually works to vindicate the map, by calling attention to a link between it and the 1503-5 world map of Niccolo Canerio. The numerous errors on the Canerio Map and its predecessor the Cantino Map in depicting Greenland and Labrador-Newfoundland, relative to their precise equirectangular projection system, are most easily explained if Portuguese cartographers copied these features from a map of the North Atlantic containing information very similar to that on the Vinland Map itself. Although Paul Saenger's 1998 review article in Imago Mundi raises some interesting points, upon close scrutiny his specifically paleographic and orthographic arguments by no means discredit the Map. Nevertheless, Saenger's and Barbara Shailor's (1987) contention that the handwriting on the Map is different than that of the Tartar Relation is a critical one, that should be looked into carefully by competent experts. Gregory Guzman's (2004) finding of a second Tartar Relation demonstrates beyond the shadow of a doubt that the Yale TR itself is genuine, despite the numerous misgivings raised by Maddison (1974). If the handwriting on the TR and VM can be shown to be the same to within a forensic margin of error, the VM would be proven genuine. Kirsten Seaver's new book Maps, Myths and Men (2004) fails to make a convincing case either that the map is a forgery or that Josef Fischer was the culprit. In particular, her contention that a misunderstanding in a 1765 work in German that Bjarni and Lief sailed together proves the map is a forgery falls apart when Skelton's translation of the pertinent caption is corrected to read that Bjarni and Leif merely shared the credit for the discovery of Vinland. A far better case could be made, on the basis of handwriting, that the VM and TR were written by the same person, than that Fischer composed either. The recent NOVA program on the map gives the very false impression that the VM is a demonstrated forgery. Although perhaps nothing short of a TR-like well-provenanced second copy of the VM, an explicit allusion to it, or a serious handwriting analysis of the map versus the TR+SH, would demonstrate it to be genuine to the satisfaction of all, the fact that it has resisted all arguments against it over the past four decades makes it begin to appear genuine after all. Baynes-Cope, A.D. "The Scientific Examination of the Vinland Map at the Research Laboratory of the British Museum," The Geographical Journal 140 (June 1974): 208-211. Bianco, Andrea. See Capurro, Marco. Beregovoy, Vladimir. "Aboriginal Samoyed Dogs of the Yamal Peninsula," undated, online at http://www.samoyed.org/yamalsams.html. Accessed 2/4/05. Brown, Katherine L., and Robin J.H. Clark, "Analysis of Pigmentary Materials on the Vinland Map and Tartar Relation by Raman Microprobe Spectroscopy," Analytical Chemistry 74 (2002): 3658-3661. Online at http://pubs.acs.org/journals/ancham/article.cgi/ancham/2002/74/i15/pdf/ac025610r.pdf, or via http://webexhibits.org/vinland/experts.html?col=webx&qt=. Cappelli, Adriano. Dizionario di Abbreviature Latine ed Italiane, Usate nelle Carte e Codice Specialmente del Medio-evo, Sixth edition. Editore Ulrico Hoepli, Milan, 1990. Cahill, T.A., R.N. Schwab, B.H. Kusko, R.A. Eldred, G. M�ller, D. Dutschke, and D.L. Wick, "The Vinland Map, Revisited: New Compositional Evidence on its Inks and Parchment," Analytical Chemistry 59 (March 15, 1987): 829-833. Capurro, Marco, "Mappamondi, Planisferi, Etc., ed altre mappe antiche diverse." Online at http://digilander.libero.it/capurromrc/mappemap.html, with color photo of 1436 Bianco planispheric map at digilander.libero.it/capurromrc/!0132bianco.html Compare the 1436 Bianco conic map at http://digilander.libero.it/capurromrc/!0119bianco.html. (URLs updated 7/09). Carvalho, David N. Forty Centuries of Ink, 1904. Online at http://www.worldwideschool.org/library/books/tech/printing/FortyCenturiesofInk/toc.html. Cawley, Kevin. "Latin Dictionary and Grammar Aid." Online at www.nd.edu/~archives/latgramm.htm. Dated 22 May 2001. Chaucer, Geoffrey, "The Canon Yeoman's Tale," in The Canterbury Tales, c. 1387, online at www.librarius.com. Clark, Robin J.H., "The Vinland Map - Still a 20th Century Forgery," Analytical Chemistry 76 (April 15, 2004): 2423, online via http://webexhibits.org/vinland/experts.html?col=webx&qt=. Deelman, J.C., "Low Temperature Synthesis of Anatase (TiO2)," Neues Jahrbuch f�r Mineralogie 6 (1979): 253-61. Donahue, D.J., J.S. Olin, and G. Harbottle, "Determination of the Radiocarbon Age of the Parchment of the Vinland Map," Radiocarbon 44 (August 2002): 45-52. Online at www.radiocarbon.org/Donahue-Vinland.htm, or via http://webexhibits.org/vinland/experts.html?col=webx&qt=. Enterline, James Robert. Erikson, Eskimos & Columbus, Johns Hopkins University Press, 2002. Eusman, Elmer, et al., "The Iron Gall Ink Corrosion Website," online at www.knaw.nl/ecpa/ink/index.html. Fischer, Joseph. The Discoveries of the Norsemen in America, with special relation to their early cartographical Representation. New York, Burt Franklin, 1903. Translation of 1902 German edition. Fuoco, Michael A. "Continuing Vinland Map feud might make Musmanno smile," [Pittsburgh] Post-Gazette Feb. 29, 2000. Online at www.post-gazette.com/regionstate/20000229mapreg4.asp. Guthrie, James L. "Analysis of Douglas McNaughton's 'A World in Transition: Early Cartography of the North Atlantic," NEARA Journal 34 (Summer, 2000): 11-14. Published by New England Antiquities Research Association. Guzman, Gregory G. "Preliminary Comments on a Speculum historiale Manuscript in the Zentral- und Hochschulbibliotek, Luzern (Latin Ms P Msc 13.2� Vol. IV), Vincent of Beauvais Newsletter, Jan. 2004, Bradley University Department of History. Guzman, Gregory G. "The Vinland Map controversy and the Discovery of a Second Version of the Tartar Relation: The Authenticity of the 1339 Text," Terrae Incognitae 38 (2006): 19-25. Harbottle, Garman. "Letter to the Editor," Radiocarbon 48 (2006): 123-6. Harbottle, Garman. "The Vinland Map: A Critical Review of Archaeometric Research on its Authenticity," Archaeometry 50, 1 (2008a): 177-189. Harbottle, Garman. "Reply to Comments of Towe et al. on 'The Vinland Map: A Critical Review of Archaeometric Research on its Authenticity,'" Archaeometry 50, 5 (2008b): 894. Heinemeier, Jan, and H�gne Jungner. "C-14 Dating of Lime Mortar," Arkaeologiske Udgravninger i Danmark 1994 (Archaeological Excavations in Denmark 1994), Copenhagen, 1994, pp. 28-40. Larsen, Ren�, Dort V. Poulsen, and Marie Vest, Report on the Assessment and Survey of the Condition and Technique of the Vinland Map and the Bindings of the Tartar Relation and Speculum Historiale, Zeitschrift f�r Kunsttechnologie und Konservierung20, 2 (2006): 249-60. L�nnroth, Lars. Review of VMTR 1995, Alv�sm�l 7(1997): 115b-120a. Maddison, Francis. "A Sceptical View of the Tartar Relation," The Geographical Journal 140 (June 1974): 187-91. McCrone, Walter C. "The Vinland Map," Analytical Chemistry 60 (1988): 1009-1018. McCrone, Walter C. "Choosing proper chemical problem-solving instrumentation," American Laboratory Oct. 1998, pp. 27-34. Online at www.icspubs.com/al/articles/a9810wmc.pdf. McCrone, Walter C., and Lucy B. McCrone, "The Vinland Map Ink," The Geographical Journal 140 (June 1974): 212-214. McNaughton, Douglas. "A World in Transition: Early Cartography of the North Atlantic," in Wm. W. Fitzhugh and Elisabeth I. Ward, eds., Vikings: The North Atlantic Saga, pp. 257-269. Smithsonian Institution Press, 2000. Murad, Enver. "Identification of minor amounts of anatase in kaolins by Raman spectroscopy," American Mineralogist 82 (1997): 203-6. Neilsen, Lauritz. Danmarks Middelalderlige Haandskrifter, Gyldendalske Boghandel Nordisk Forlag, K�benhavn, 1936. NOVA/WGBH, "The Viking Deception," produced by Jonathan Dent for Granite Productions, Feb. 8, 2005. Check the NOVA schedule website at www.pbs.org/wgbh/nova/schedule.html for rerun times and videotape purchases. Olin, Jacqueline S. "Without Comparative Studies of Inks, What do We Know about the Vinland Map?" Pre-Columbiana 2 no. 1 (June 2000): 1-10. Online at www.si.edu/scmre/learning/vinland_map_ink.htm. Olin, Jacqueline S. "Evidence that the Vinland Map Is Medieval," Analytical Chemistry 75 (Dec. 2003): 2645-47, online via http://webexhibits.org/vinland/experts.html?col=webx&qt=. Painter, George D. "The Matter of Authenticity," The Geographical Journal 140 (June 1974): 191-194. Perkins, R.M. "Norse Implications," The Geographical Journal 140 (July 1974): 199-205. Prijs, Bernhard. Die Basler Hebr�ischen Drucke, URS Graf-Verlag, Olten und Freiburg I.Br., 1964. PVMC. See Washburn, ed., Proceedings of the Vinland Map Conference (1971). Reimer, Stephen P. Manuscript Studies: Medieval and Early Modern, Section IV.vii, "Paleography: Punctuation," dated 2 Dec. 1998. Online at www.ualberta.ca/~sreimer/ms-course/course/punc.htm. Rei�land, Birgit. "Historically used conservation methods," in "The Iron Gall Ink Corrosion Website," undated, online at www.knaw.nl/ecpa/ink as of 8/22/02. Saenger, Paul. "Vinland Re-read," review of VMTR 1995, in Imago Mundi, 50 (1998): 199-202, online at http://www.maphistory.info/saenger.html. Seaver, Kirsten A. "The 'Vinland Map': Who made it, and why? New light on an old controversy," The Map Collector No. 70 (Spring 1995): 32-40. Seaver, Kirsten A. �Christopher Who?� Mercator�s World, May 2002. Seaver, Kirsten A. "The Chart before the Norse," Toronto Globe and Mail, Nov. 29, 2003, p. A26. Seaver, Kirsten A. Maps, Myths and Men: The Story of the Vinland Map Stanford University Press, 2004. Shailor, Barbara A. Catalogue of Medieval and Renaissance Manuscripts in the Beinecke Rare Book and Manuscript Library, Yale University, Vol. II: MSS 251-500. Medieval & Renaissance Texts & Studies, Binghamton, New York, 1987. Skelton, R.A., Thomas E. Marston, and George D. Painter, with Introduction by Alexander O. Vietor. The Vinland Map and the Tartar Relation Yale University Press, 1965 (VMTR). Reprinted in 1995 with new prefatory essays by Painter, Wilcomb E. Washburn, Thomas A Cahill and Bruce H. Kusko, and Laurence C. Witten II (VMTR95), but original pagination retained in body. Snyder, John P. Flattening the Earth. University of Chicago Press, 1993. Spalding, Tim. "Vinlanda: The Vinland Map on the Web" website, online at www.isidore-of-seville.com/vinland/index.html. Dated 2000-2001. Towe, Kenneth M. Letter to Alexander Orr Vietor, Dec. 17, 1974. Towe, Kenneth M. "The Vinland Map: Still a Forgery," Accounts of Chemical Research 23 (1990): 84-87. Towe, Kenneth M. "The Vinland Map Ink is NOT Medieval," Analytical Chemistry 76 (Feb. 1, 2004): 863-865, online via http://webexhibits.org/vinland/experts.html?col=webx&qt=. VMTR, see Skelton et al (1965/1995). Wallace, Birgitta. "The Viking Settlement at L'Anse aux Meadows," in Wm. W. Fitzhugh and Elisabeth I. Ward, eds., Vikings: The North Atlantic Saga, pp. 208-224. Smithsonian Institution Press, 2000. Wallis, Helen. "Introduction to a Symposium on the Strange Case of the Vinland Map," Geographical Journal 140 (1974): 183-7. Wallis, Helen. "The Vinland Map: fake, forgery, or jeu d'esprit?" The Map Collector No. 53 (Winter 1990): 2-6. Washburn, Wilcomb E. Proceedings of the Vinland Map Conference (PVMC), held 1966, with contributions by Paul Fenimore Cooper, Jr., Armando Cortes�o, Thomas E. Goldstein, Einar Haugen, Melvin H. Jackson, Gwyn Jones, Ib R�nne Kejlbo, Stephan Kuttner, Robert S. Lopez, Oystein Ore, John Parker, Konstantin Reichardt, Vsevolod Slessarev, Boleslav B. Szczesniak, Erik Wahlgren, and Laurence Witten, and extended commentary by the invited participants. University of Chicago Press, 1971 PVMC. Weaver, Charles E. "The Nature of TiO2 in Kaolinite," Clays and Clay Minerals 24 (1976): 215-8. Wilford, John Noble. "Study Casts Disputed Map as False Link to Vikings," The New York Times Feb. 26, 2000.
minor corrections, 3/11/05, 4/1/05, 9/13/05, 9/15/05. Towe letters and indicated paragraph added 8/11/06. Further indicated paragraph added and typo corrected 8/21/06. Section "Update 2008" and associated references added 9/12/08. Some links added, URLs corrected, and Guzman (2006) added, 8/09. This site received 10,415 visits, 11/1/04 - 12/26/05.